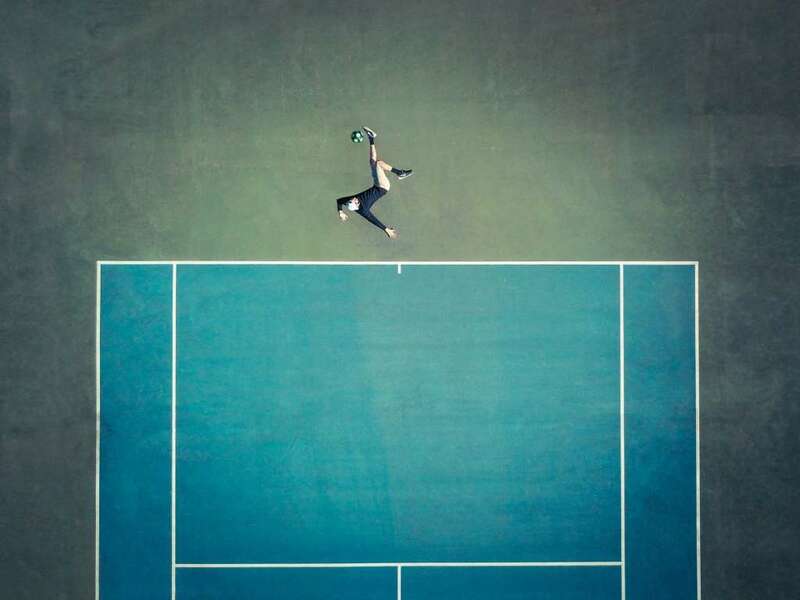 Drone photography has taken its own course defining the method photography recently. 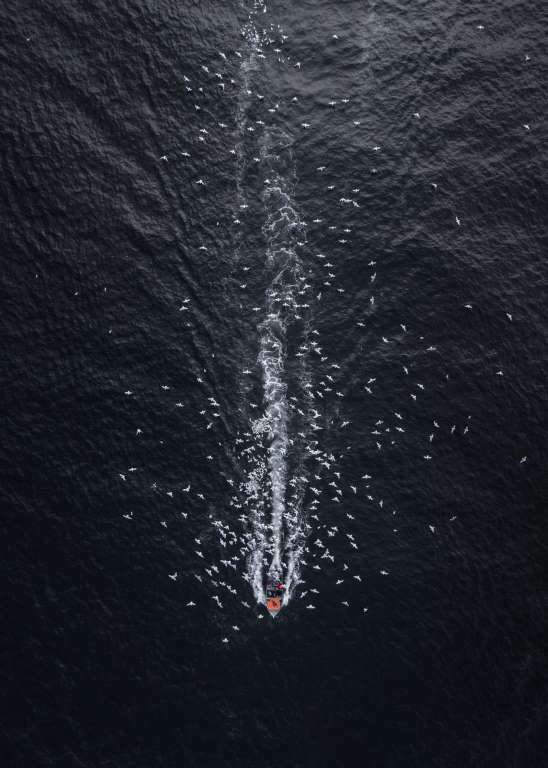 Every now and then we see quality images soaring in numbers with many of the breathtaking photos taken from the skies. There come so many new photos in this domain that they have now an official award program named after it. On the other hand, the companies manufacturing drones have been equipping them with latest cameras to capture high quality drone pics for quality viewing. 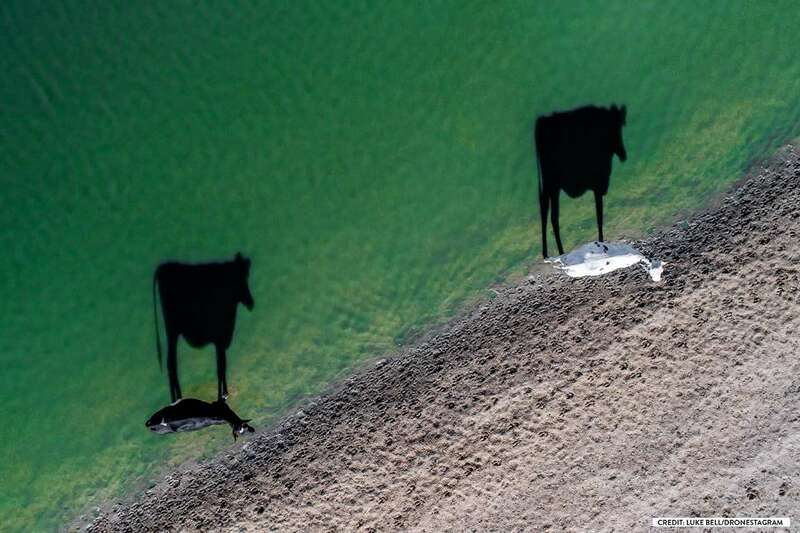 May be we see these drone pics as if they are piece of the cake but the truth is that is just icing on the cake. Snapping a quality drone photo requires professionalism, practice, patience and potential at the same time. 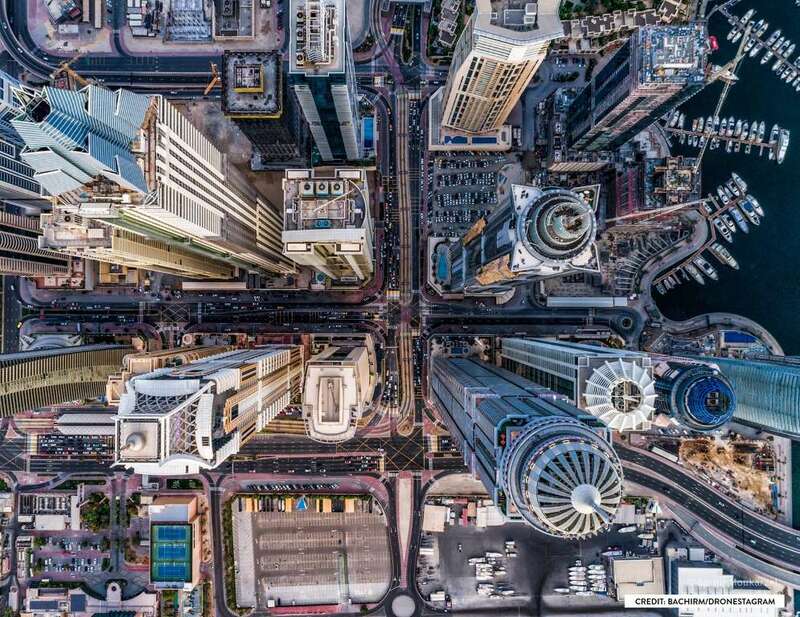 We have round up some of the coolest drone pics taken from the skies available in plenty at Dronestagram and the Skypixel published by msn to show you how stunning drone photos can be at times. 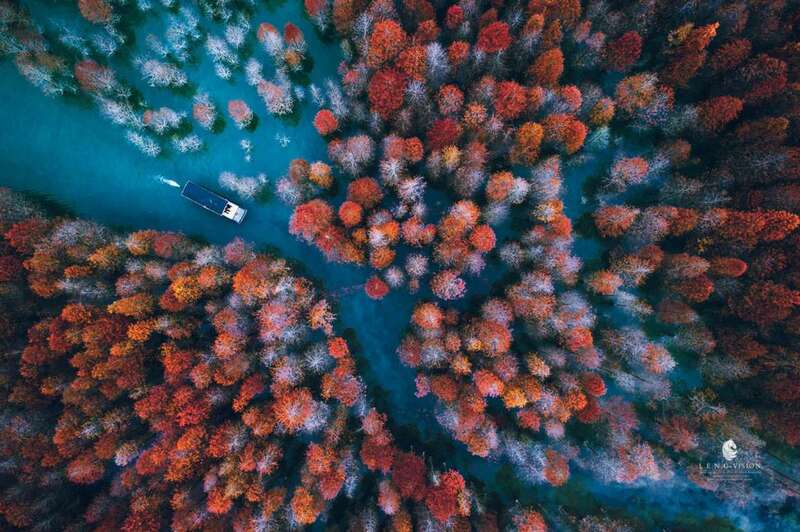 Drone photography master Micheal L B. Rasmussen took this image when he was on a walk in the woods. A brilliantly vibrant and colourful view of the forest below is just breathtaking. 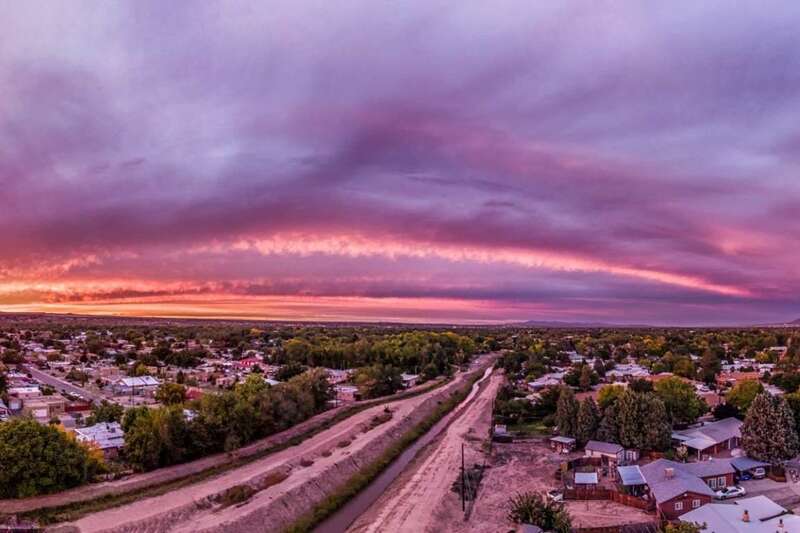 It makes an absolute sense to use drones for snapping amazing sunsets. We certainly get a better view of the horizon and the way up in the sky. This photo is the perfect epitome that summarizes with the colours of the falling sun casting brilliant hues across the clouds and the view is just unbelievable. Island coastlines are a undisputed favourites with the drone photographers and with snaps like this, it’s easy to see understand why. 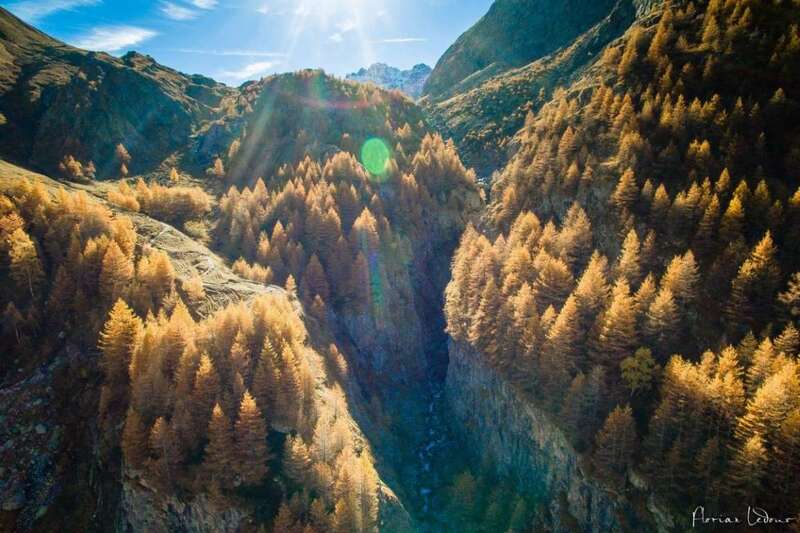 One more beautiful drone picture featuring copious amounts of trees. This sunshine drenched peninsula makes for a brilliant aerial photography. 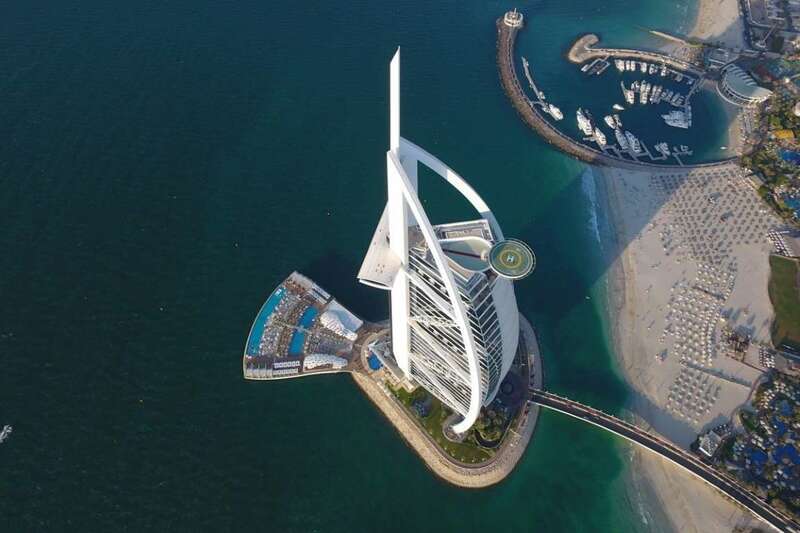 This aerial pic depicting a magnificent building with its own landing pad is beautifully captured in drone camera. While seeing it from the distance it makes us assume that attempting to land a drone on it would not be a good idea though. We very often see scenery like this from the window of an aeroplane only while traveling. Whether it’s low cloud cover or thick fog in either case, the ground below is shrouded in thick mist. New York City is one of the places that see regular snowfall. 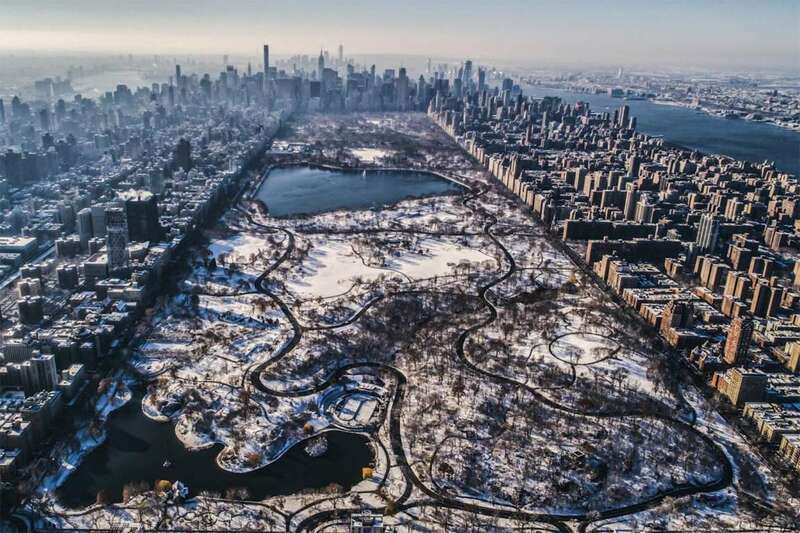 The city’s park looks stunning from this angle – even more so when sprinkled in wintry snow. 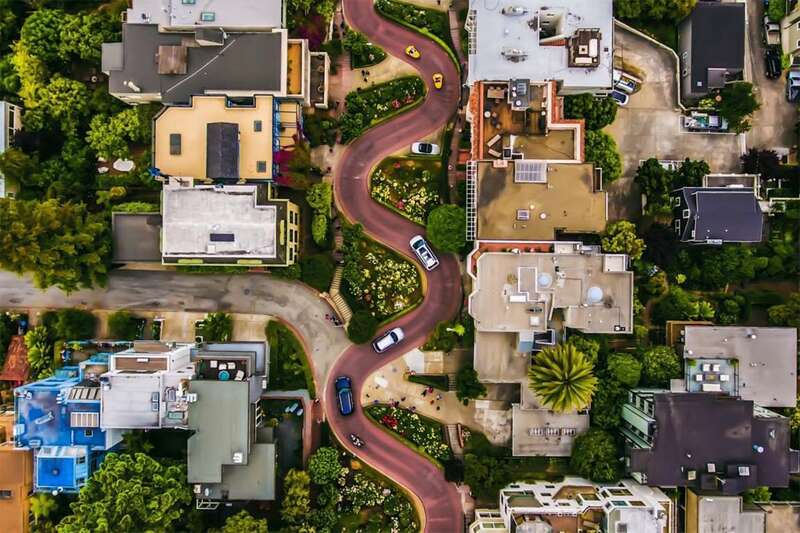 Some people can easily identify this image as the famous Lombard Street – reportedly “the crookedest street in the world”. This windy road is certainly iconic and this drone photo is a rare visual treat. 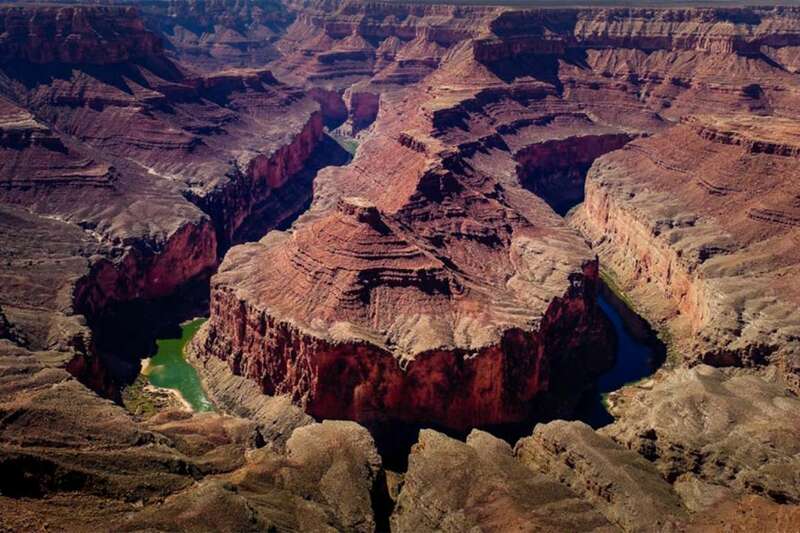 This brilliant drone photos shows Tatahatso Point at the Grand Canyon. A popular photography spot, but not often seen from the sky like this. 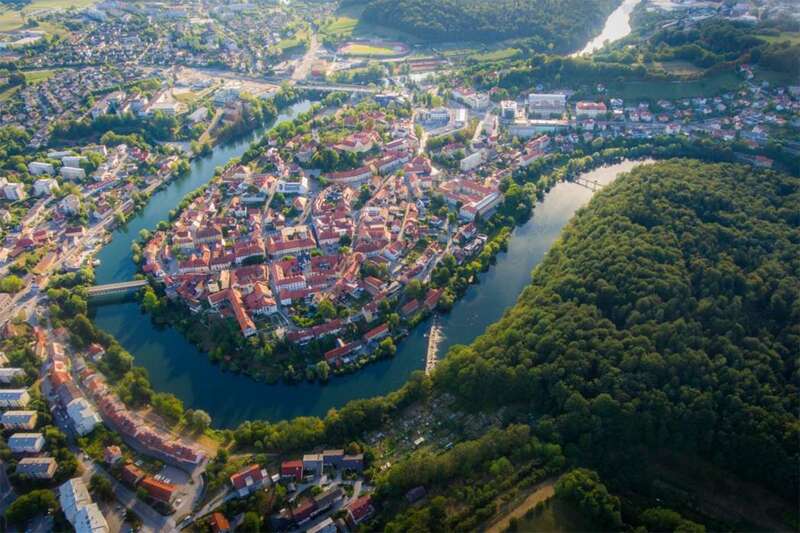 This unbelievable scenic beauty is seen in the town of Novo Mesto, by the border of Croatia. 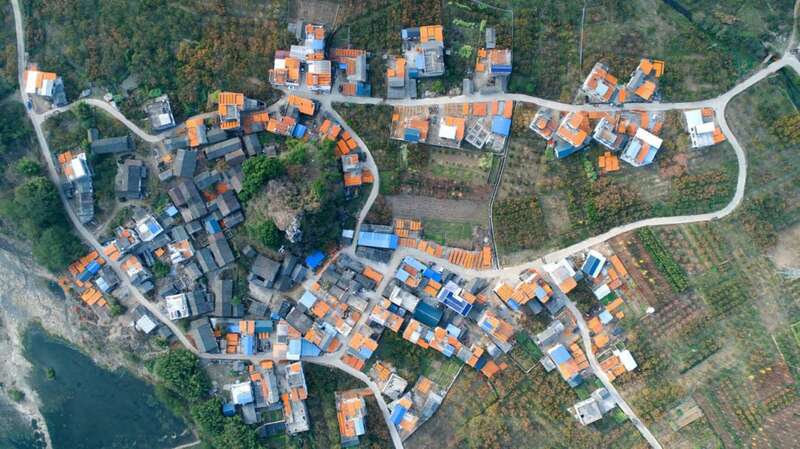 An absolutely green landscape, winding river and close-knit community can be easily seen from the sky and it is one of the beautiful pictures you’ll ever see. 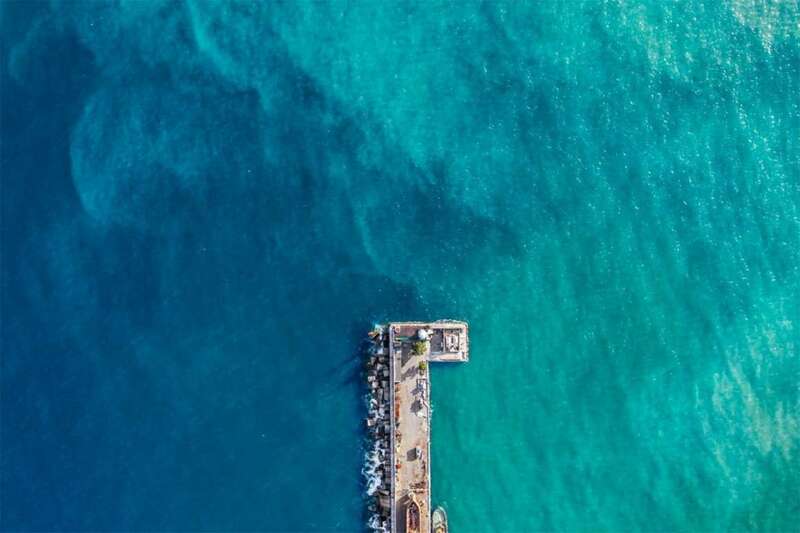 The aerial view of a lighthouse on the coast of Yalta is featured in this drone image. The waters are actually the Black Sea and all that makes this a high photo of which the lighthouse appears a tiny part. This unique photo has not been snapped as high from the sky as some of the others on this list, but that’s doesn’t make it less great. 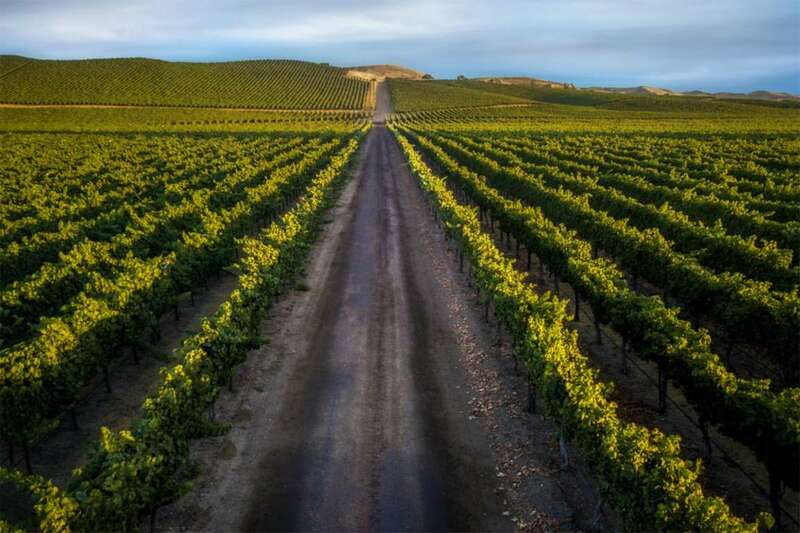 However, the aerial view of rows and of vines stretching off so far as the eyes can see gives fantastic vibes. In the red dusty plains, a lonely house sitting surrounded by nothing but the only red dust, brush and the occasional very distant tree. The buildings casting magnificent shadows across the land which makes this photo one of the beautiful ones. Roads, roads, so many roads and only roads everywhere. But who needs roads when you can fly? Certainly not this drone. 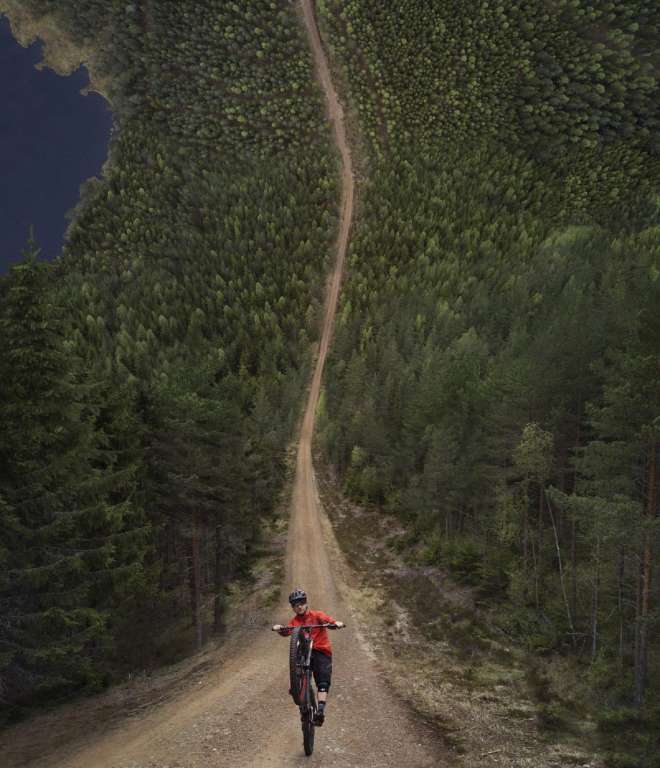 This photo is actually the result of a number of different several photos stitched together to create the magnificent final result. This stitching is giving the impersonation of a bending world just like the popular movie “Inception 2006” that stretches off into infinity. 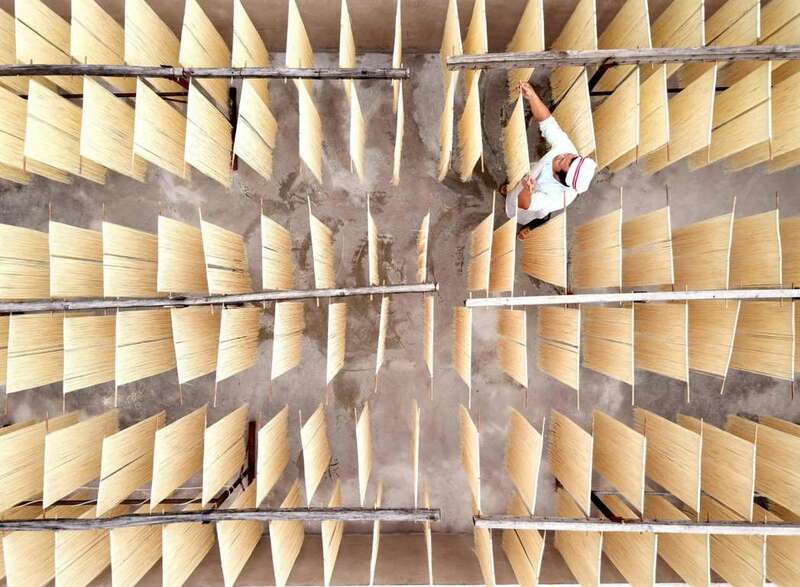 This above photo shows a Chinese fisherman engrossed in the waters, plying their trade. 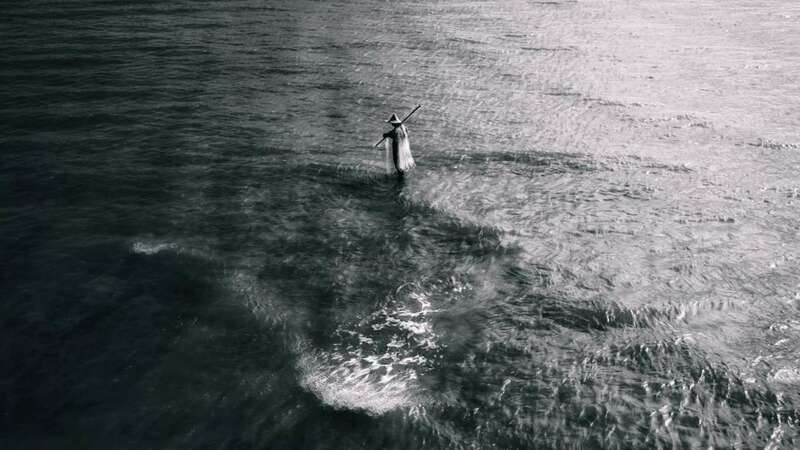 This image was one of a series of similarly beautiful images captured above the waters. 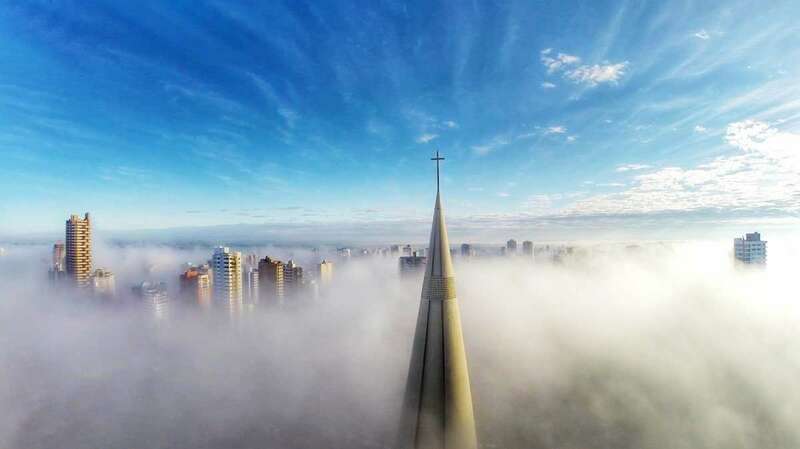 This image was taken in the skies of China, one of the series of a number of magnificent images which were snapped by this professional photographer using a DJI Phantom 4 Pro. One of these images is depicting the rural villages in a conglomerate and the hard labor that goes into reaping the crop of fruit. 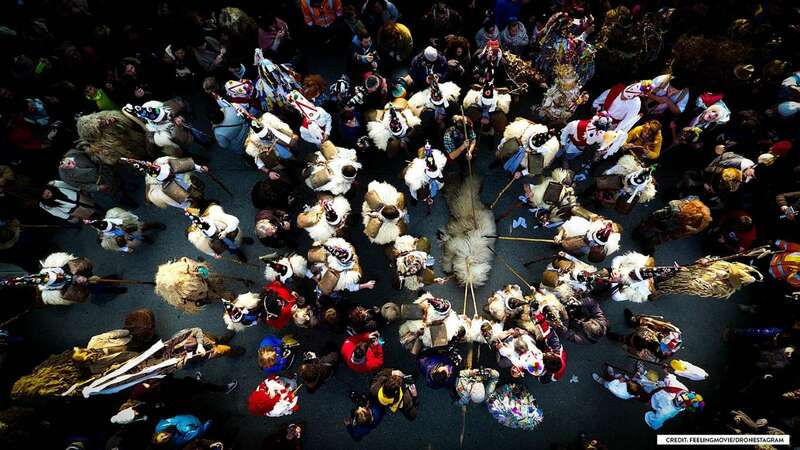 This aerial scenery was chosen as the runner-up in the professional story category. 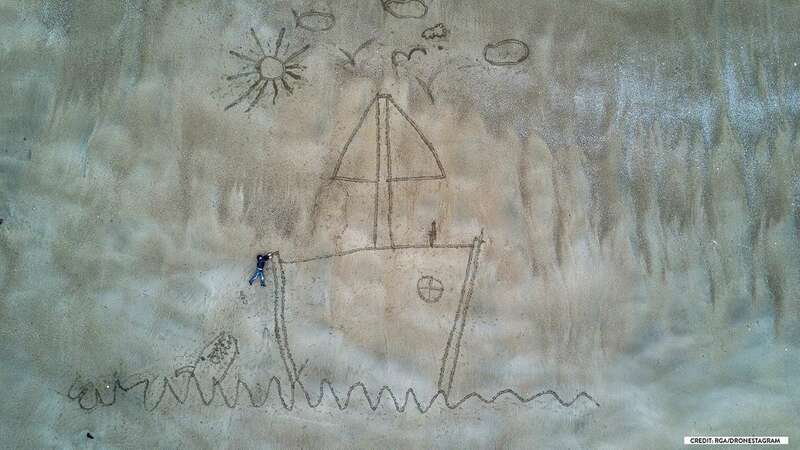 We’d recommend you to check out the rest of the images too. This drone photo is a part of a series of photos featuring the damage industrial waste has done to the landscape. 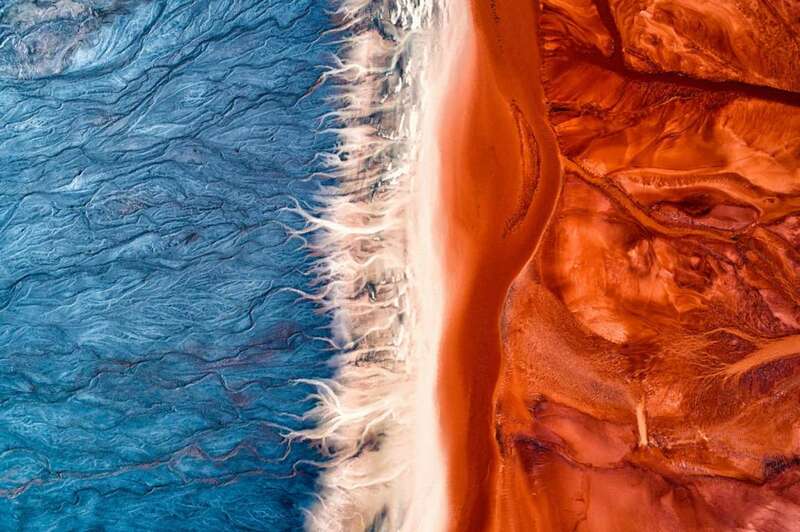 Although showing waves of beautiful colour that appeal our eyes for the moment, these aerial photographs are actually highlighting the damage mankind has done to the world. 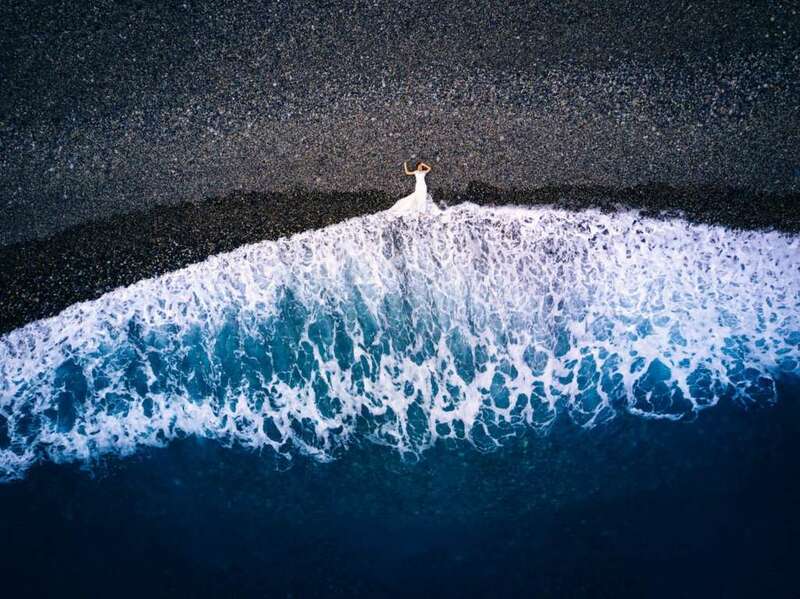 This image hails from the shores of Taiwan, this drone image shows the photographer laying by the edge of the water, the whitewash of the waves blending and some of it disappearing with her white dress or vice versa. This amazing image was nominated as a professional image in the portrait category. 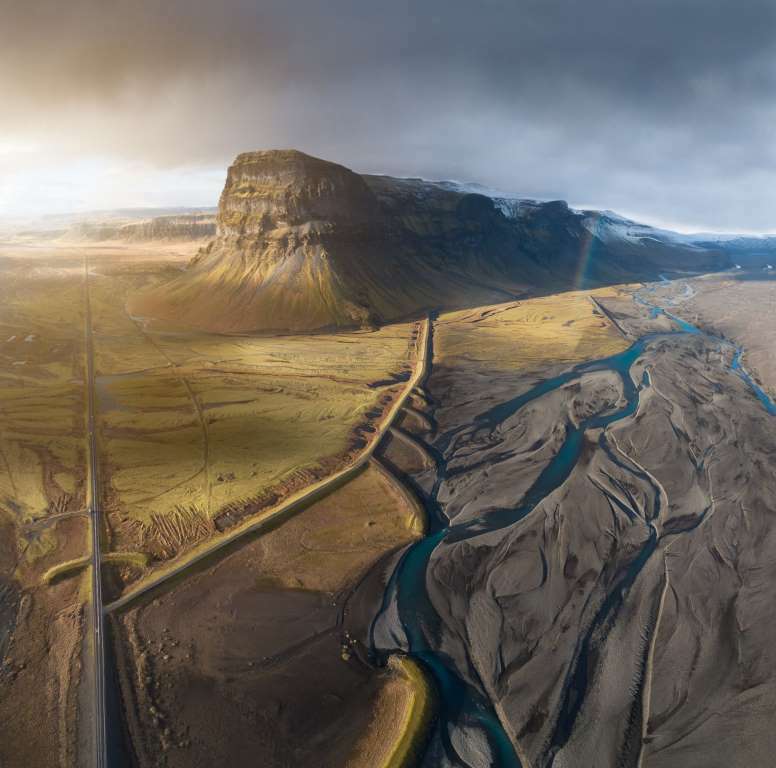 This drone image was captured from the 1,500 feet above the rivers of Iceland. The swooping lines represent the sublime beauty of nature and this photo is a part of the series of equally impressive photos with a similar theme. 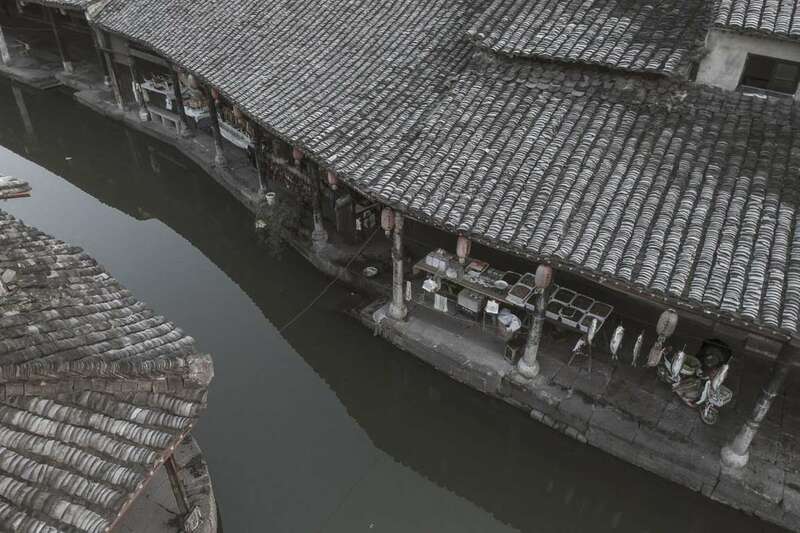 This aerial picture presents an old town around the twisting waterways. This town used to be known only for its produce decades ago, but now it is also known for its views. 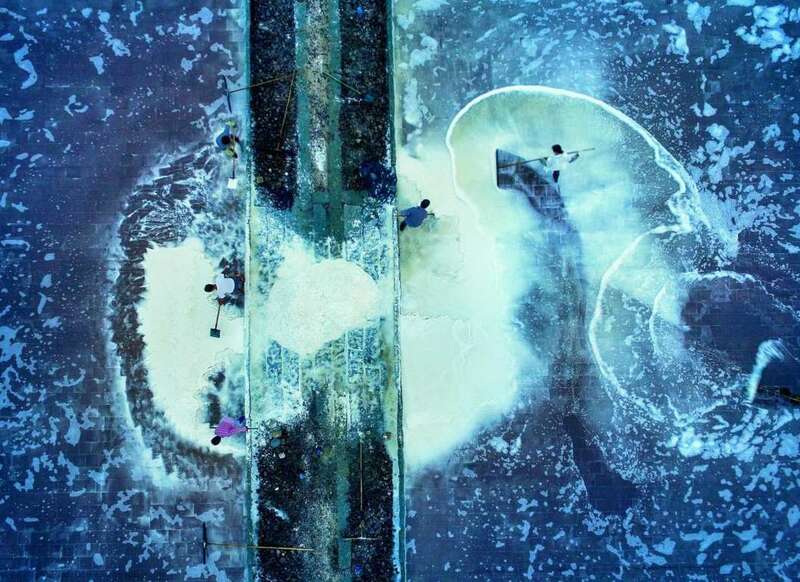 This aerial image is captured with a DJI Phantom 4 and is showing the beautiful docks of the Yantian District, China and is a part of the series of beautiful images of workers caring for the docks and maintaining the surfaces. 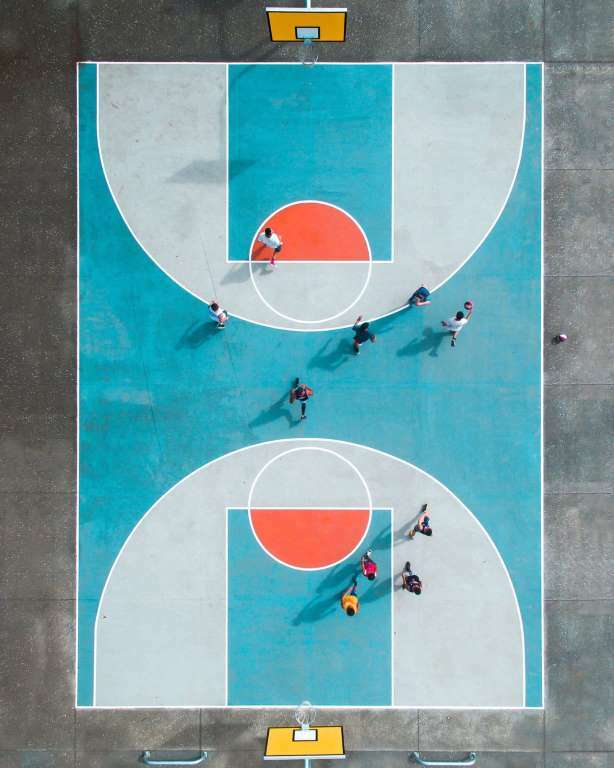 This aerial photo of the basketball courts of Auckland manifest amazingly contrasting colours and brilliant symmetry from the skies. This image by Petra Leary, won first prize in the professional portrait category in 2017’s Skypixel awards. 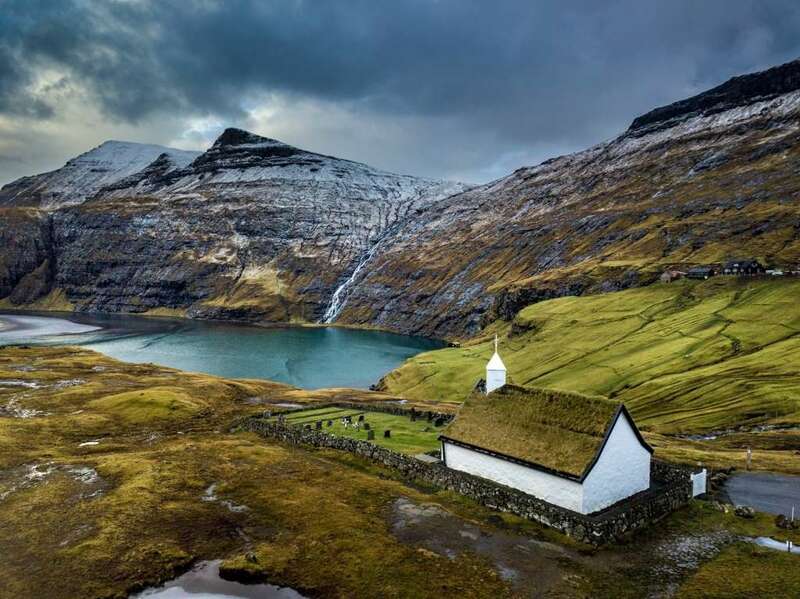 Saksun is a very small village hibernating in the northwestern part of the Faroese island of Streymoy and is surrounded by supreme landscapes with beautiful views of the nature. This amazing aerial image of the local church was captured by Ian Montgomery with his Mavic Pro and was later submitted to the Sky Pixel contest. 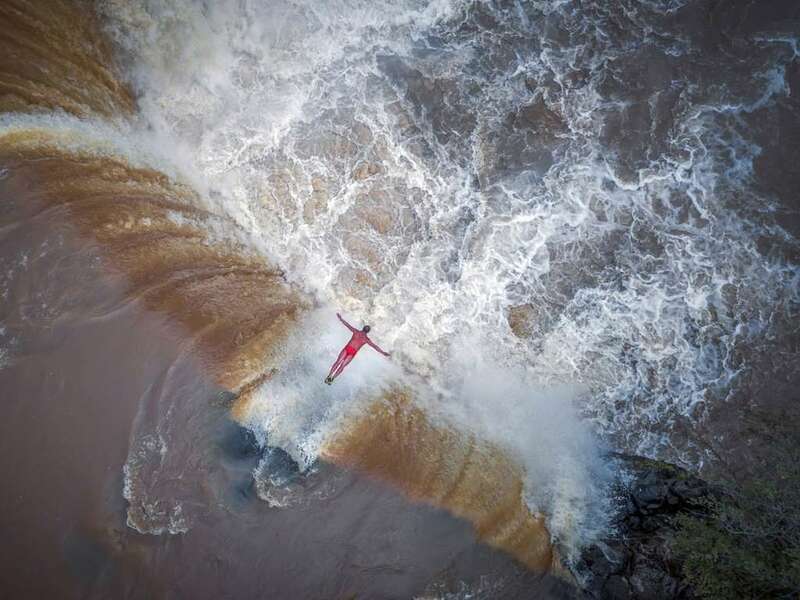 A lone man is featured in this aerial image diving over the waterfall. 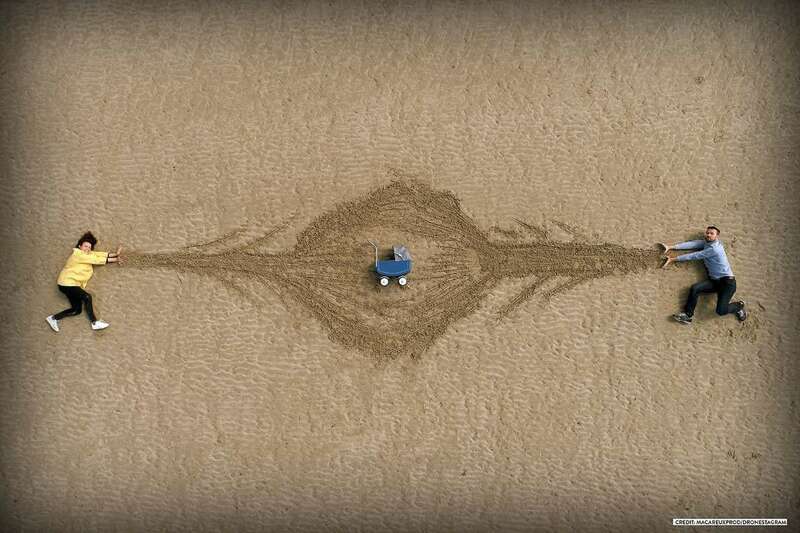 This perfectly timed drone image shows a Guinness World Record holder carrying out his passion. 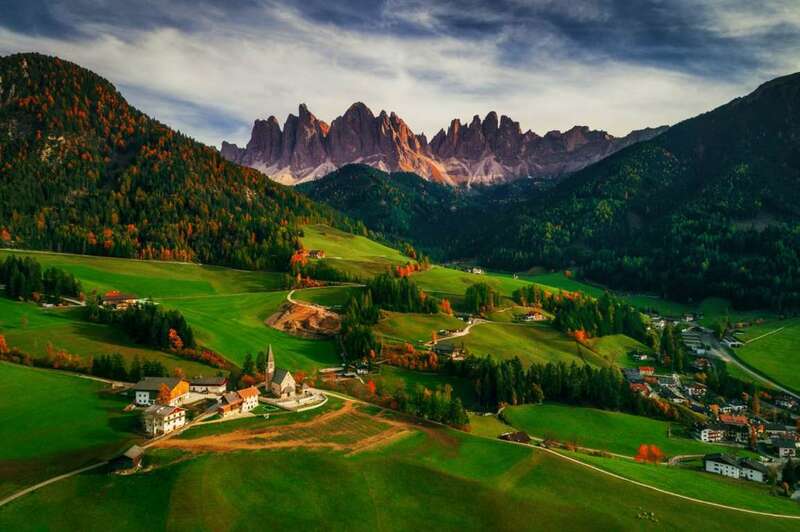 This breath-taking aerial image shows the incredible lush green hills surrounding the Santa Maddalena in Italy. 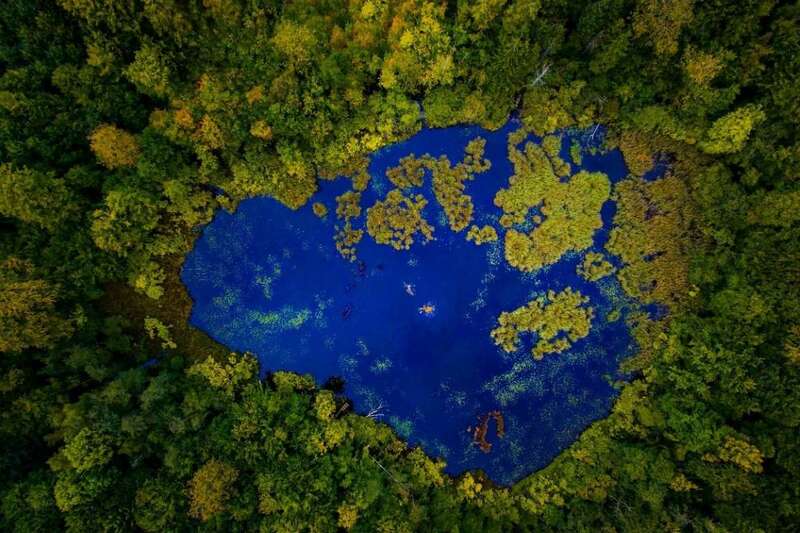 A brilliantly colourful green sheet of nature captured with a man-made drone. 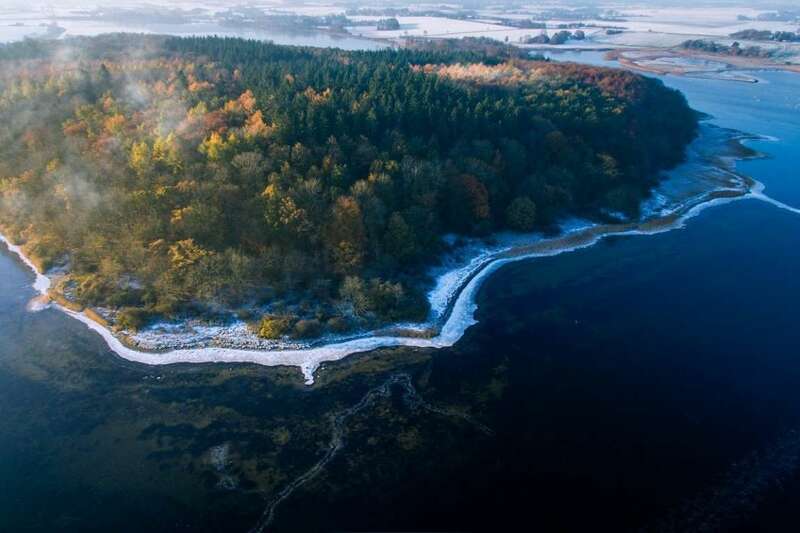 Another very beautiful aerial photograph taken with the Phantom 4 Pro shows the wonderful reds of the Autumn trees. 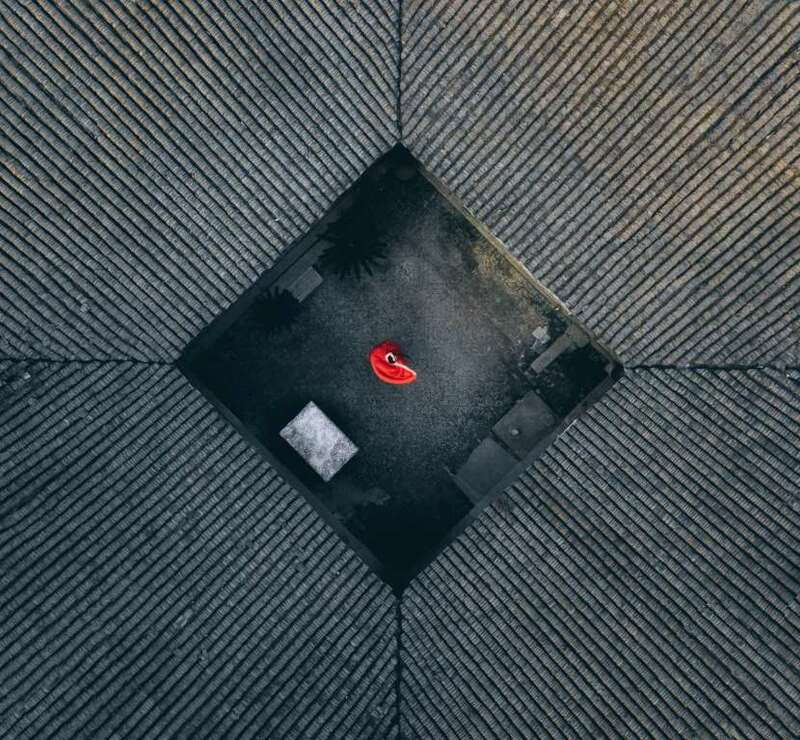 This brilliantly simple image is captured with a DJI Mavic Pro and is showing a dancer in the centre of an ancient courtyard in Shanghai, China. 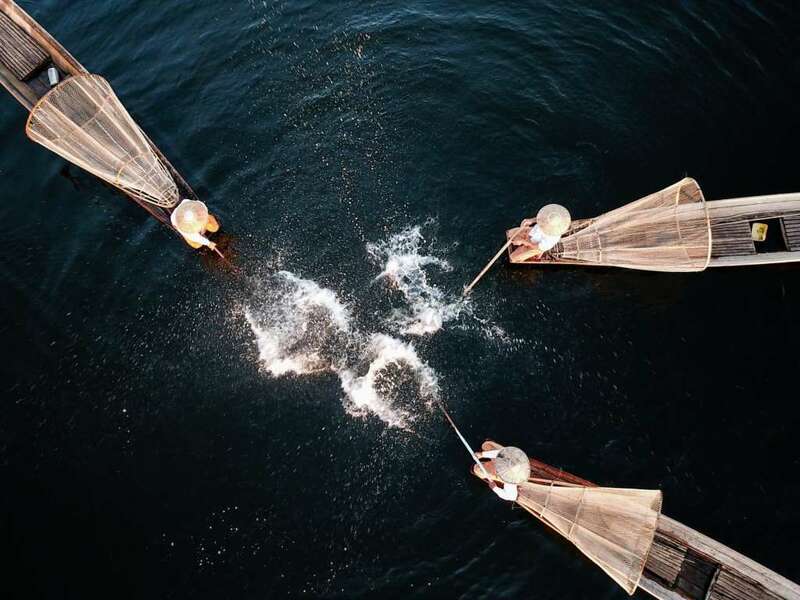 This aerial image was taken during the early hours of the morning, in Newfoundland Canada, a professional drone photographer sent his drone up to see what he could see on the waters. A fishing boat approaching the shore is flocked by seagulls, no doubt trying to snag an easy catch of their own. 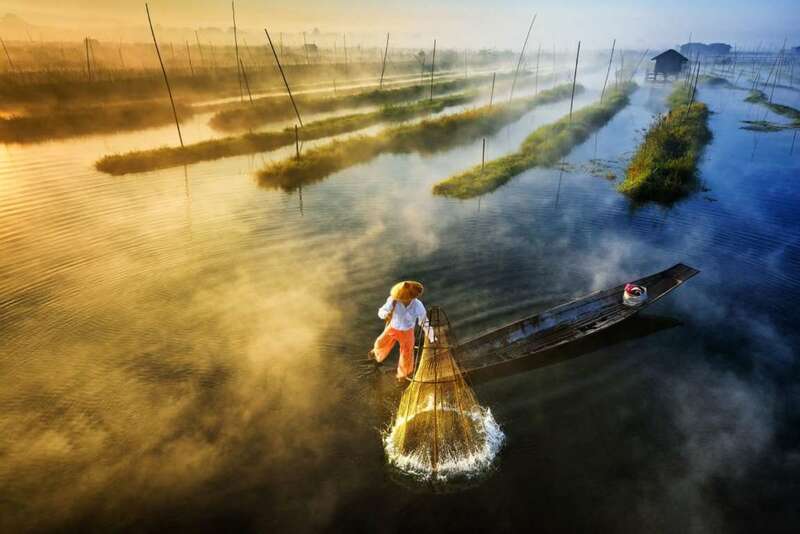 This beautiful picture features a fisherman who is on his boat on the waters of Inle Lake. This talented master is not only rowing with his leg, but has also been managing to catch fish at the same time. A brilliant photograph that deserved the prize. 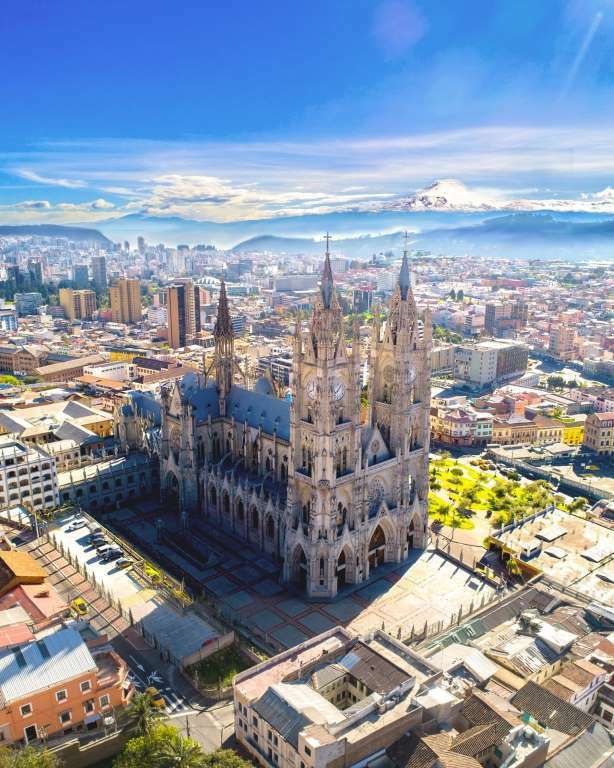 A beautiful sun-soaked view of the Basilica del Voto Nacional, a Roman Catholic church which dominates the horizon of Quito, Ecuador. The magnificent church was blessed by the Pope in 1985 and is considered one of the biggest attractions of the vicinity. It also makes this for an impressive drone photo as Alex Javier proved with this snap using his Phantom 4 Pro. This aerial picture is really tricky for the naked eye giving the impression of a cyclist mounting the side of a skyscraper. 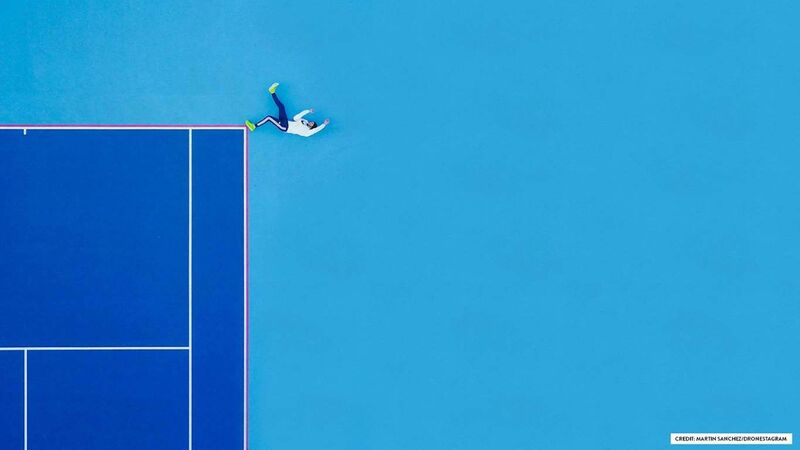 Nigel Kwan’s image was professionally captured with a Mavic Pro. 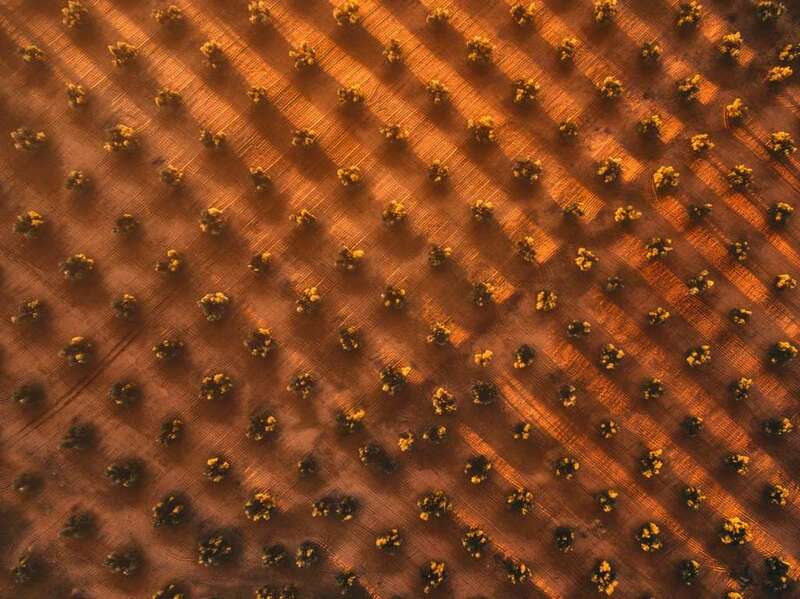 Javier del Cerro captured this brilliant aerial snap of the amazing symmetry of the olive tree groves of Castilla La Mancha, Spain and it shows how unique many common things appear from the sky. 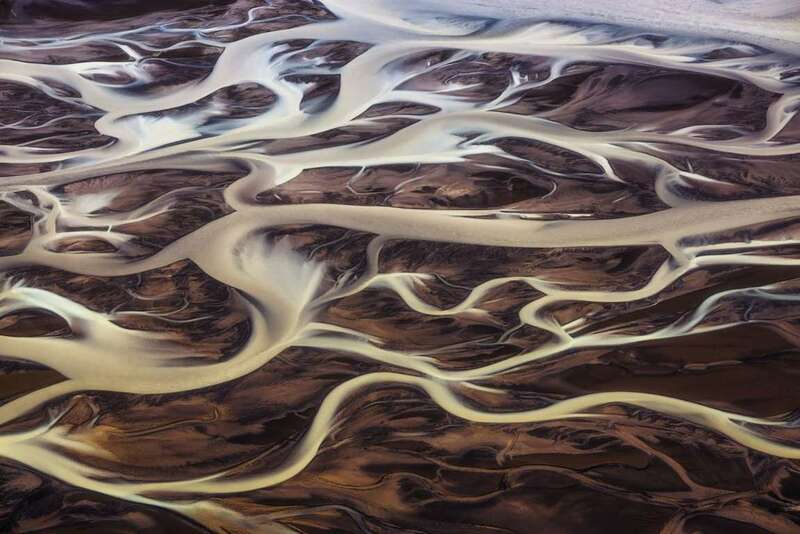 This highly incredible aerial photo of the landscapes of Iceland is actually 12 separate images stitched into one. It is an amazing panoramic shot of the surroundings with the cloud-covered mountaintops which is cut through by the landscape of flowing rivers. 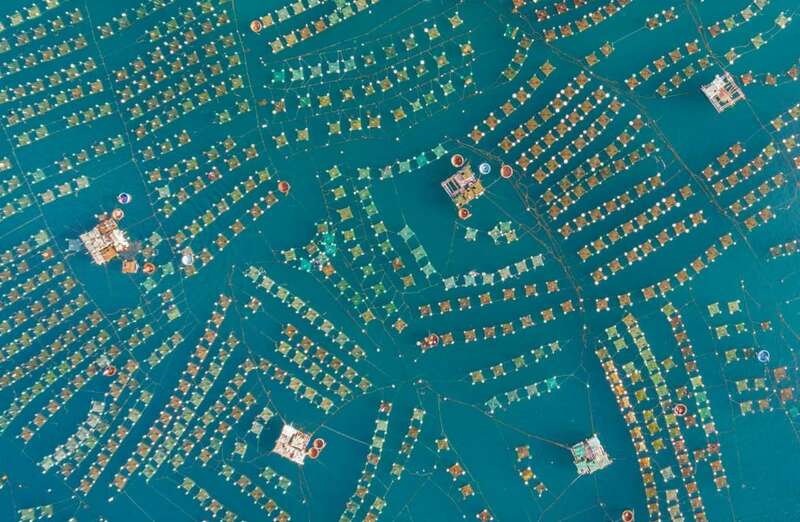 This aerial image was snapped atop the waters of Vietnam, Trung Pham captured this image of the lobster farms of the Phu Yen province. The striking colours and mix of man-made materials with natural imagery makes ground for an incredible aerial image and it is very well captured. Is n’t it? 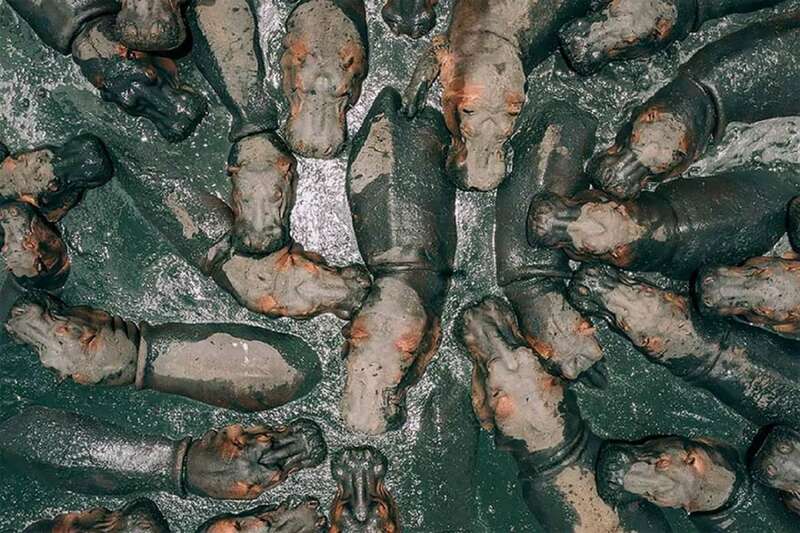 This was was taken from the skies above Vietnam with drone showing ducks being raised by the local farmers there. 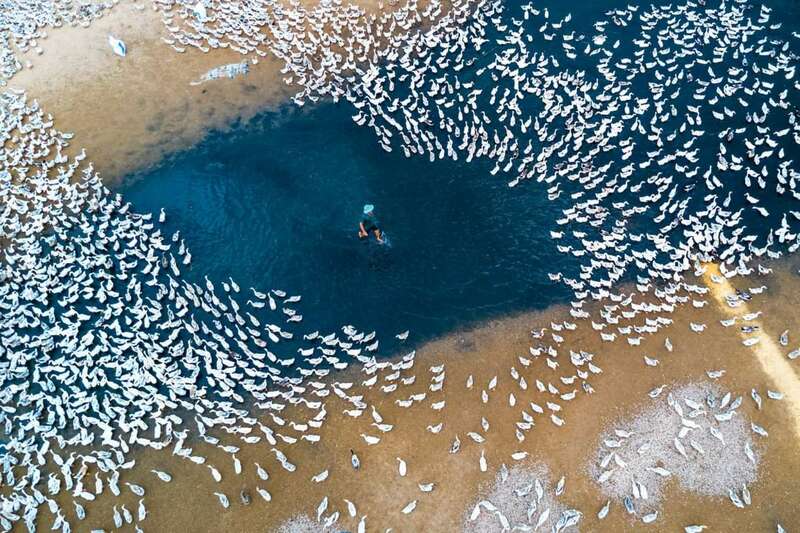 The swarms of ducks look so thick like a white mass of ducks relax on the peaceful riverways while the farmer works. 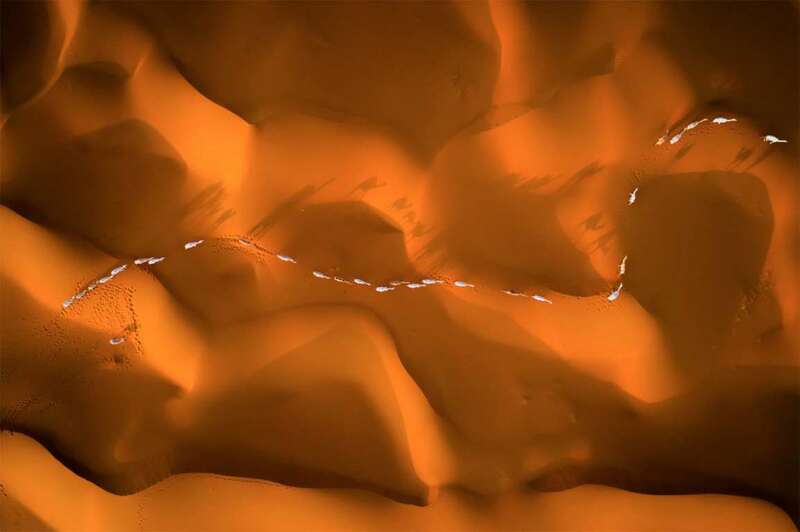 This image by Abdullah Alnassar was captured using a Phantom 4 Advanced and shows camels crossing through the sand dunes of Saudi Arabia which are commonpalce there and the beaming shadows of the animals stretch out across the dunes as they make the trek to bemuse the photographer. This intelligent picture shows an absolutely new perspective and makes perfect use of the Mavic Pro’s photography capabilities. 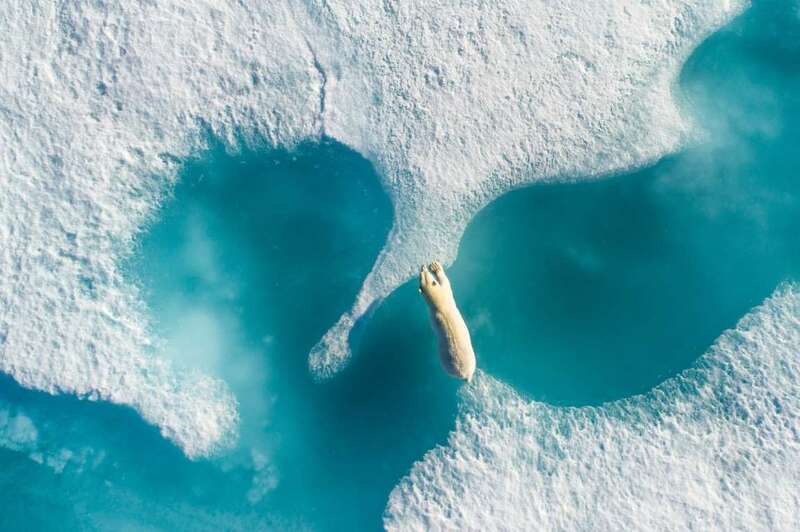 The photographer Florian Ledoux is 27-year-old and has moved to Reykjavik recently to be closer to the Arctic, started to photograph in Greenland in 2014 to “report changes in Inuit culture and to witness the beauty of this huge land”. 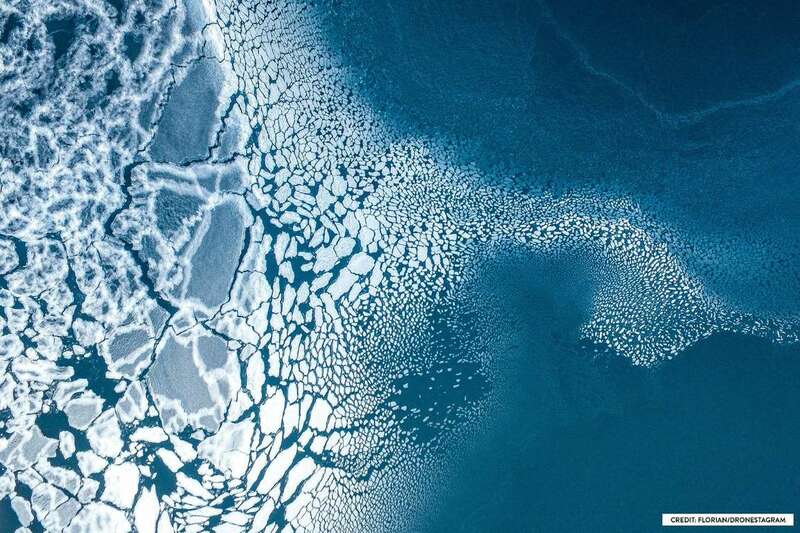 This drone image was snapped during winter in East Greenland – one of the most remote place on Earth. According to him he had attempted to fly around this place several times, and his drone was attacked by two Gyrfalcon as well. 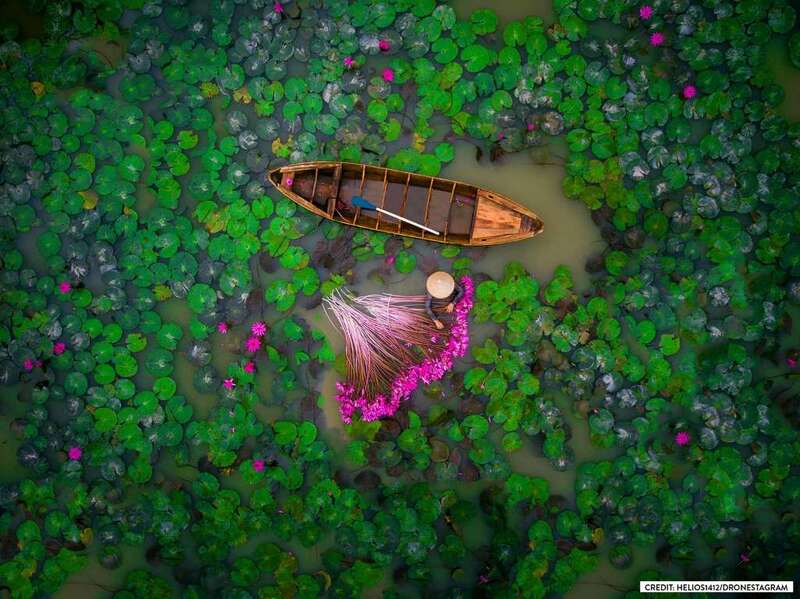 A breath-taking view from above the waterways of Vietnam featuring a lone worker wading through the deep water. 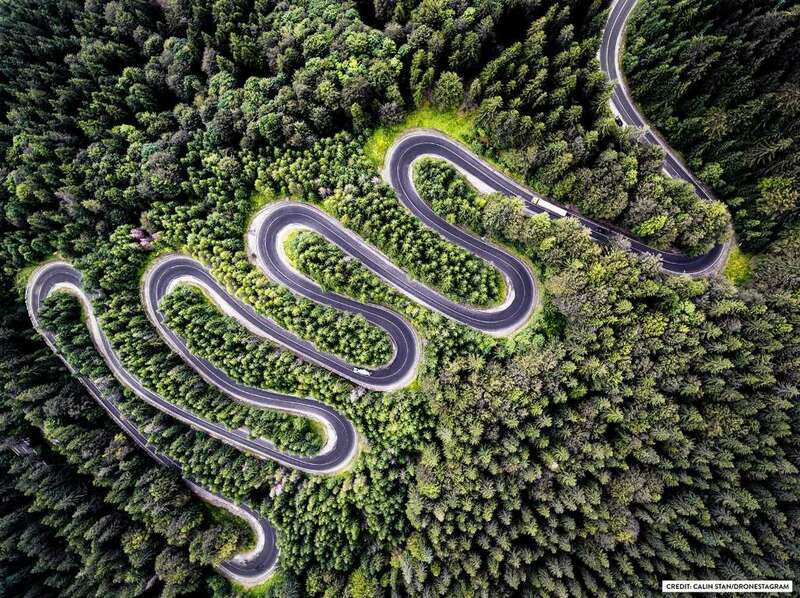 The photographer of this aerial image Calin Stan is 30-year-old who has worked pro photographer for more than a decade and owns his own photography business, said his drone image is of the Cheia DN1A road that leads us to Transylvania in Romania. Or, as the legend says, this is the view that “Count Dracula himself saw on his nocturnal flight”, Stan explained. 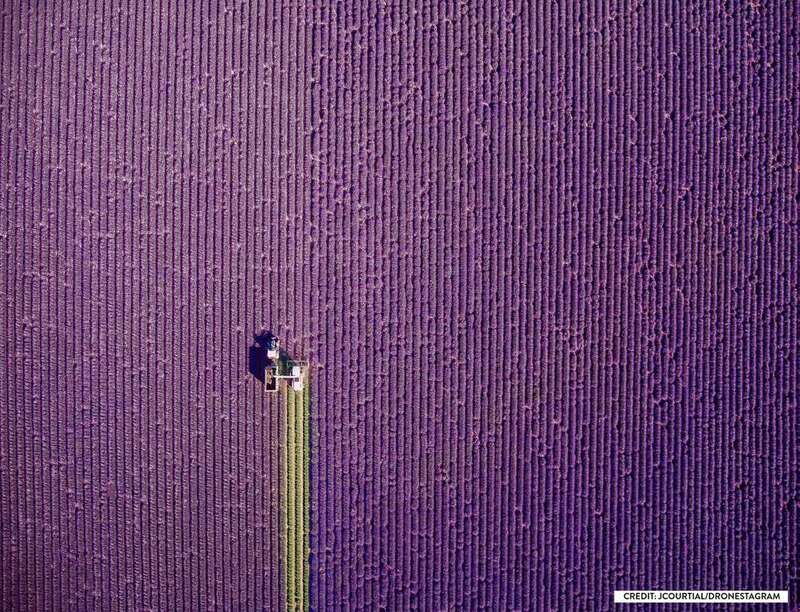 This photographer of this image Jerome Courtial is 39-year-old Frenchman based in London, went to Valensole to get “an original picture rather than the classic view with the sunset in the background”. His girlfriend remained with him, during an interview when his image was chosen as the No. 1 winner of Dronestagram’s 2017 awards, he cordially thanked her for her patience, as they “waited quite a long time to find the perfect spot”. The photo ended up to be his favourite picture ever taken. 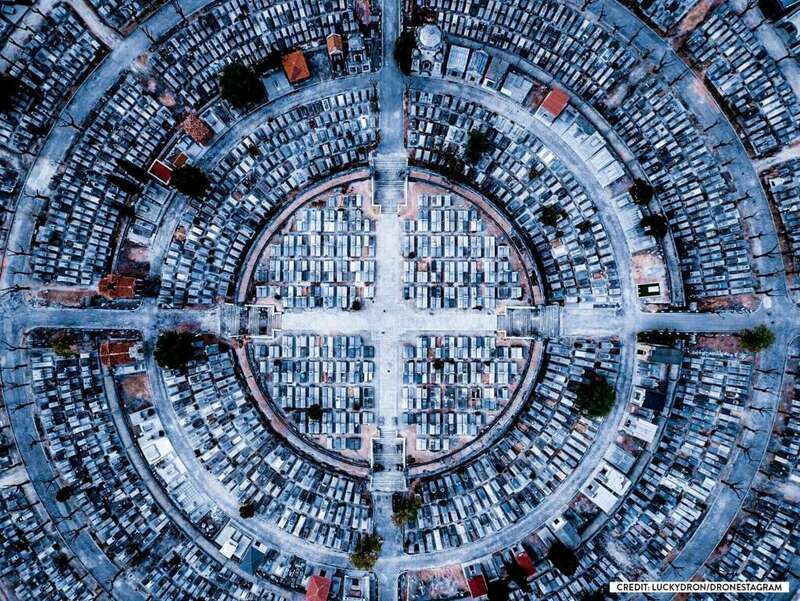 The photographer of this aerial image Luis Saguar Domingo is 24-year-old who says he got his drone as a Christmas present and was in Madrid looking for a suitable place to fly the new drone. He feels amazed after seeing the beautiful scenery and feels relaxed when flying simply because of all the beautiful landscapes he can see, and when he took this picture, he thought it was “really cool and symmetrical”. The featured Roman Colosseum is a phenomenally magnificent site from the ground and from most angles. It’s not less than a marvel of architecture being a crucial wonder and gives a fantastic view of the history. 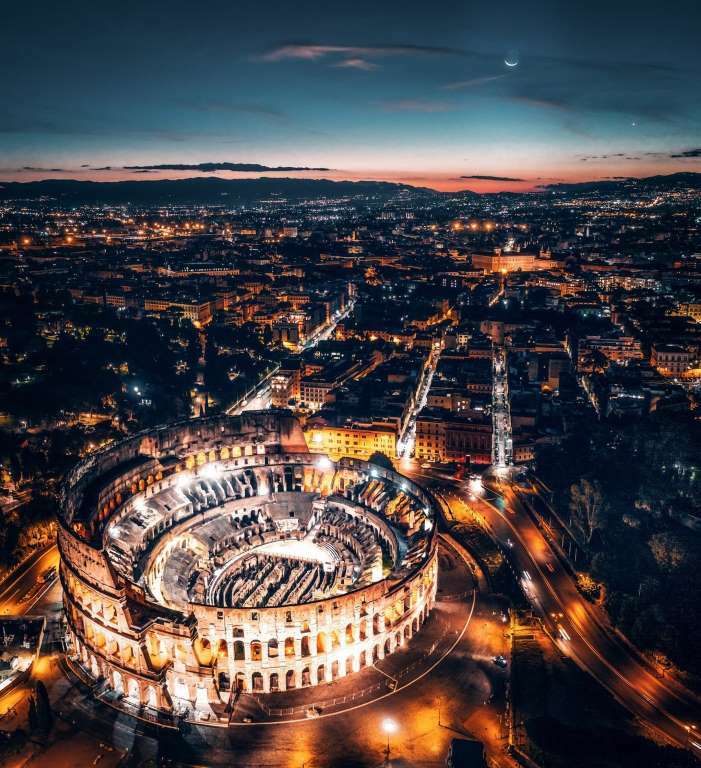 Just when we thought it couldn’t get any more impressive than that, along came this drone image by Mauri Pagliai showing it in full nighttime splendor from the sky. 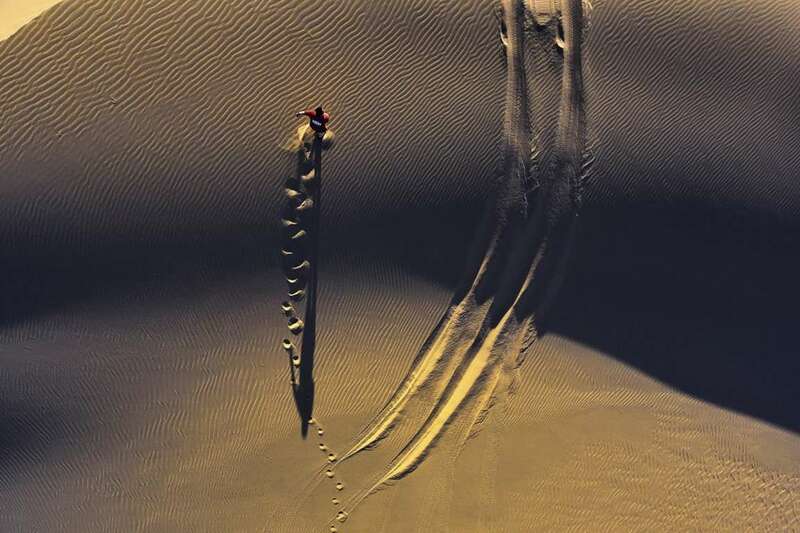 This image was selected for one of the People’s Choice Prizes in the Sky Pixel contest. 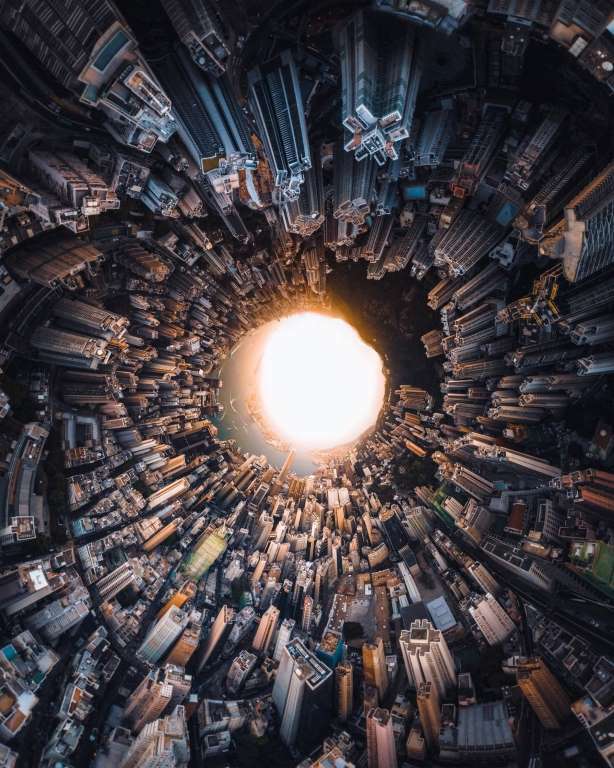 Like we said before it looks like the same just like an other scene out of Inception, this drone image snapped with a Phantom 4 Pro depicts a dream-like view of Hong Kong. 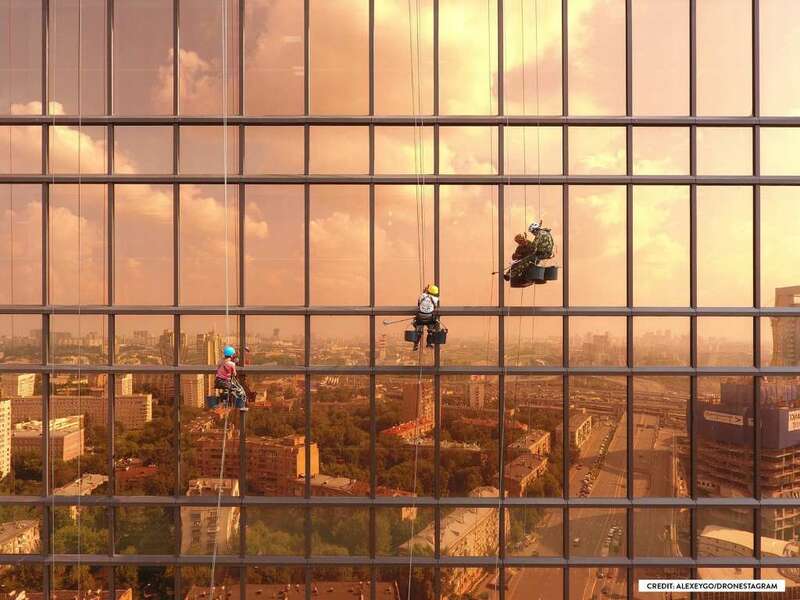 A compendium of 43 images used just to create this amazing view and it’s certainly marvelous. 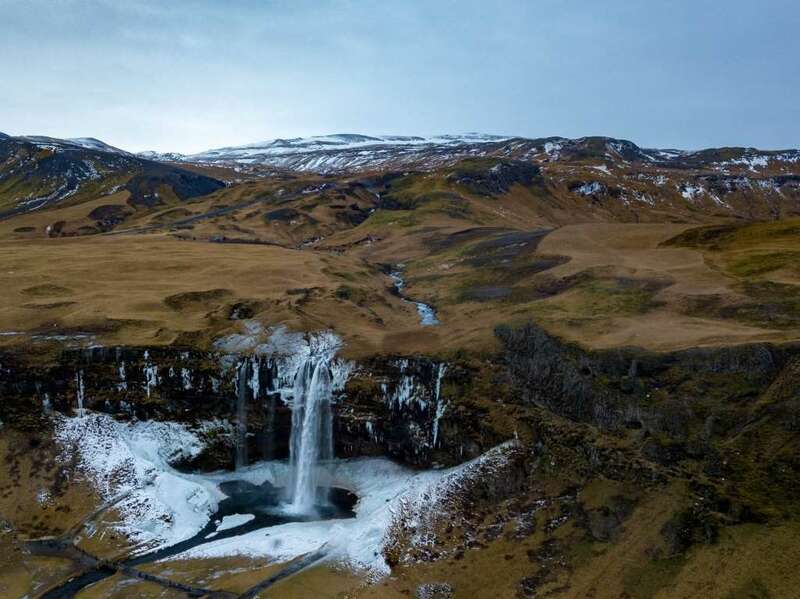 A beautiful Mavic Pro aerial image of the Icelandic landscapes and one of the many ice-encrusted waterfalls visible across those landscapes. Simply splendid. One more brilliantly snapped image with Mavic Pro. This time from Yellowstone National Park in the US. 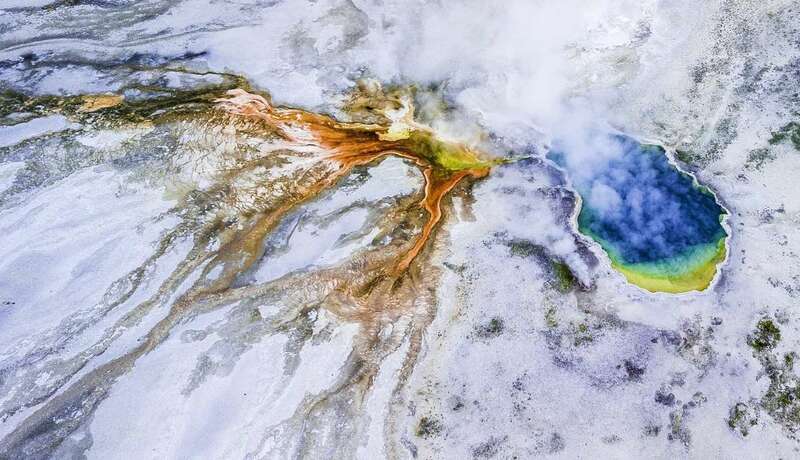 The icy surface below shows magnificent colours flowing as hot sulfur water finds its way through the thick crusty snow. 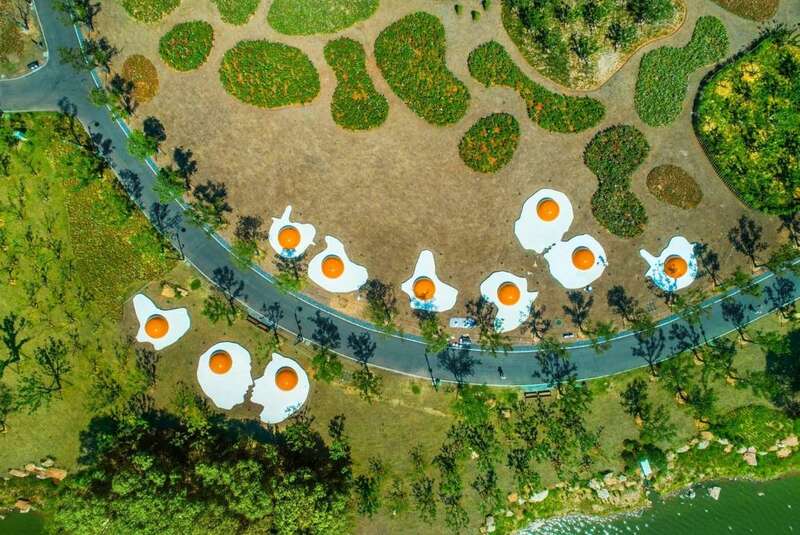 A compellingly interesting scenic view from the side of the water and roadways in East Lake, Wuhan, China shows sculptures near the lake of eggs just like kissing. Absolutely an unusual beautiful view from the sky. 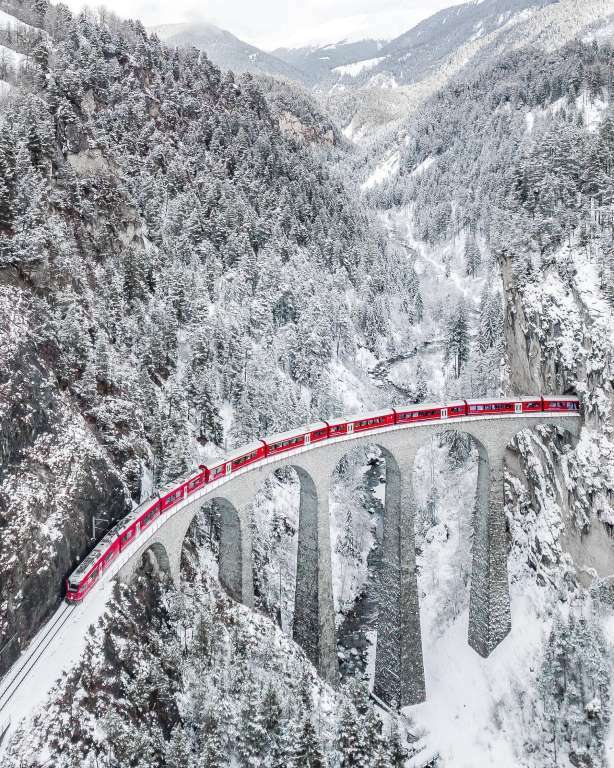 This incredibly contrasting aerial photo from the sky features a fantastic red train passing through the white snowy mountains of Switzerland. 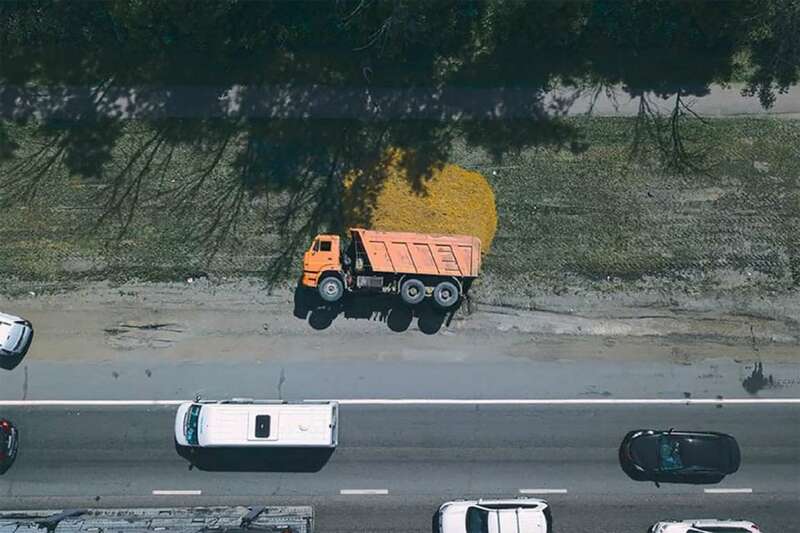 A mishap of an unhappy accident gives view for a pretty cool drone image. A lorry has tipped down over and split the load on the side of the road. Ilya Martyanov noticed the tipping of it and quickly dashed out to send his drone up for a cheesy aerial image. The result of which is an awesome image about the pitfalls of modern day life. 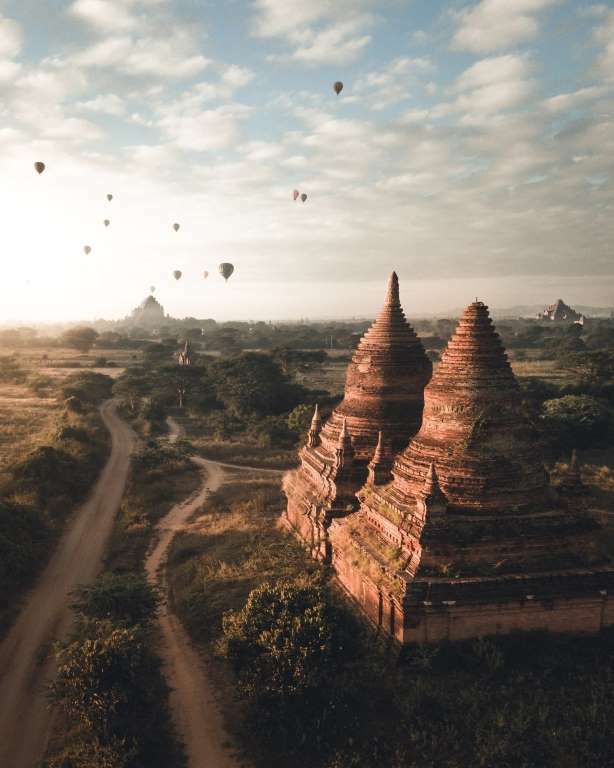 This cutely captured drone image was snapped in Bagan, Myanmar by Witold Ziomek. He used a Mavic Pro drone to take the finest image of the ancient architecture backdropped by hot air balloons. 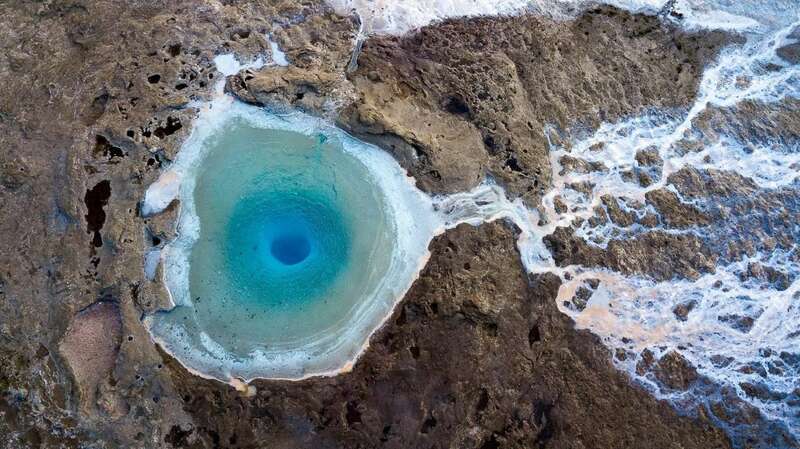 An amazing view of the eye shot from Iceland presents what it looks like a colourful eye of Mother Nature shedding a river of colorful misty tears. This brilliant aerial photo of the geyser Strokkur was captured with a Mavic Pro drone and submitted to the Sky Pixel contest. 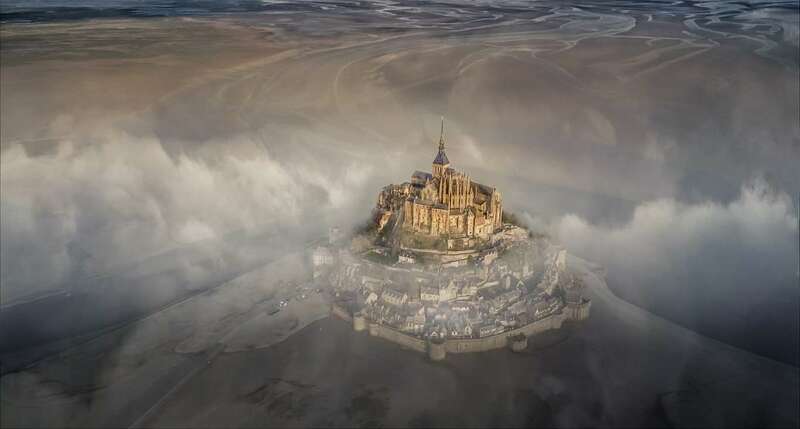 This awesome aerial image features the popular French monastery Mont Saint Michel surrounded in the stunning morning fog. 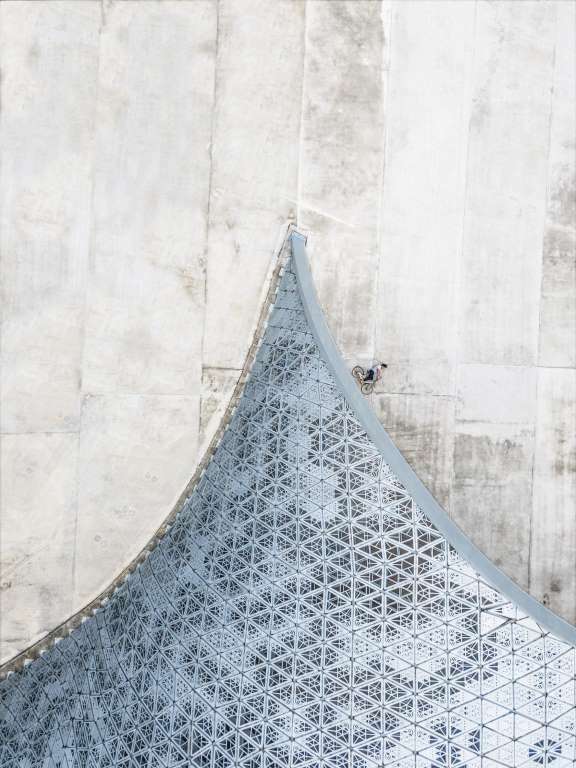 This photo was selected as the winner of grand prize in 2018’s Skypixel contest. This is undoubtedly a beautiful aerial image of the awe-inspiring temple. 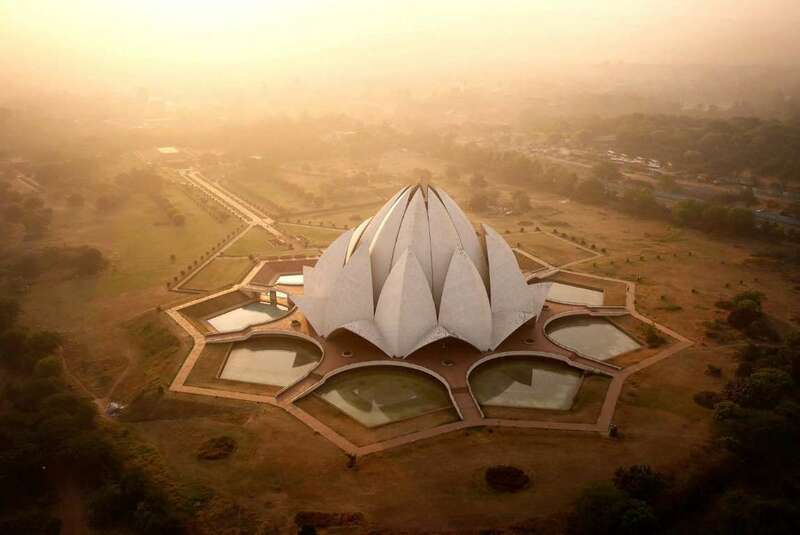 This Lotus Temple is located in Delhi, India and is famed for its flowerlike shape. 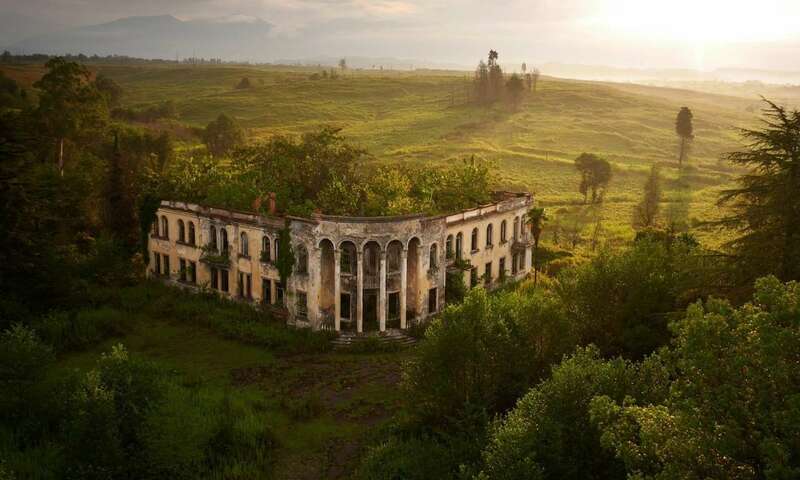 This drone image features the beautiful view of the countryside of the Republic of Abkhazia. It depicts an astoundingly beautiful landscape with a tragic history as this is part of the region where ethnic cleansings occurred in the 1990s. People were forcefully thrown out from their forever homes, brutally mutilated, murdered and persecuted. Now remains a forsaken college and a site as a sign of grief and a homage to this hard times of history. This is a remarkably wonderful image of the Church of Saint Petersburg, Russia. The image features the Church of the Savior on Spilled Blood. 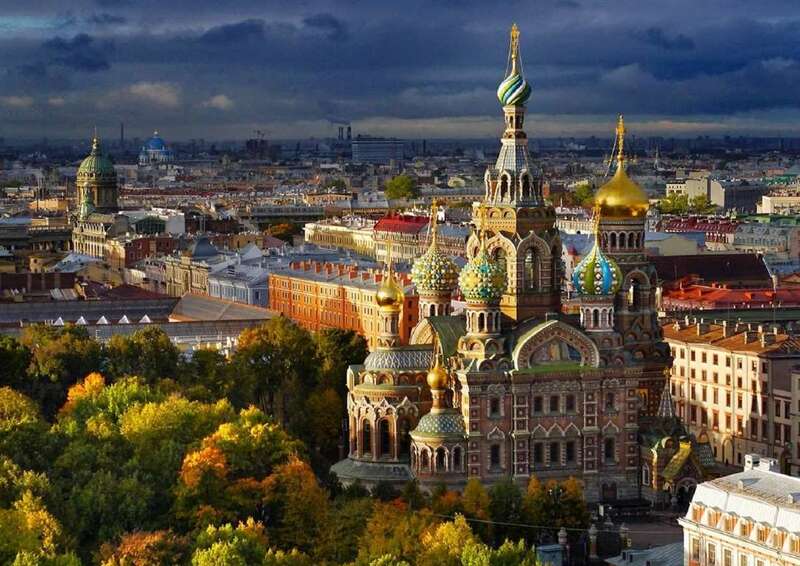 The construction of this incredible building began back in 1893 originally, and is an epitome of a romantic nationalism architectural style by Alfred Alexandrovich Parland and Archimandrite Ignaty. This featured sight of Fort Bourtange was originally constructed in 1593 in the Netherlands as a defense to control the road between Germany and the city of Groningen. It has truly stood the test of good and bad times alot in the history. The decades and centuries have passed and now it has been converted into a historical museum. 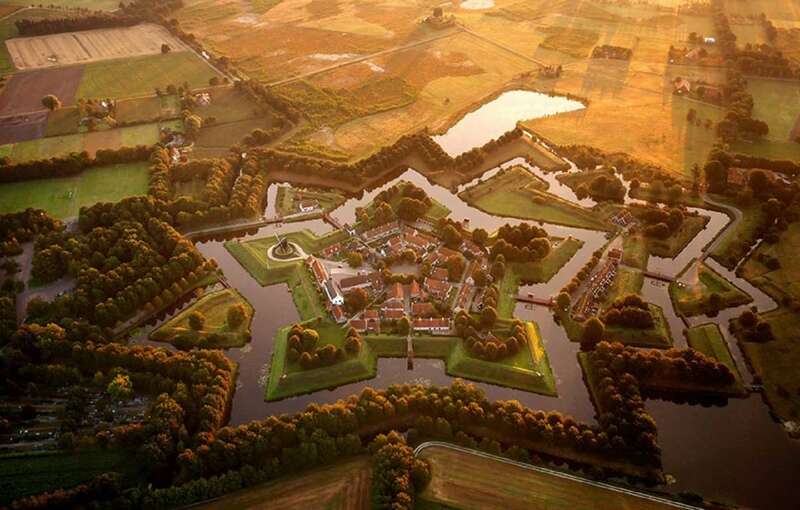 From above, Fort Bourtange is certainly beautiful, surrounded by defensive moats and brilliant countryside. 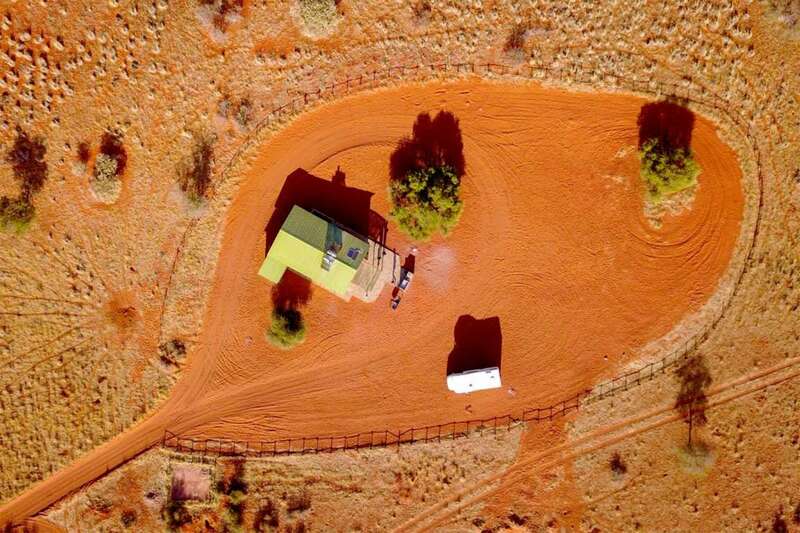 One of the beautifully captured drone images. 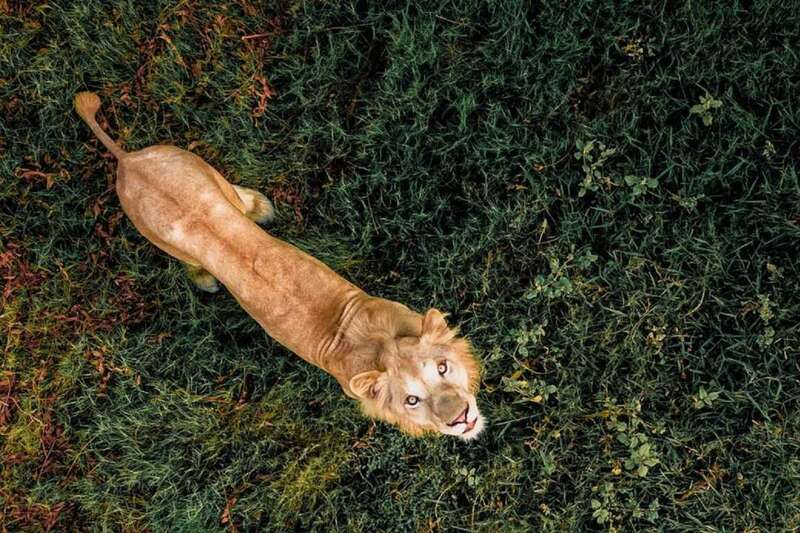 It features the lion quite not impressed by the drone flying the wild arena. 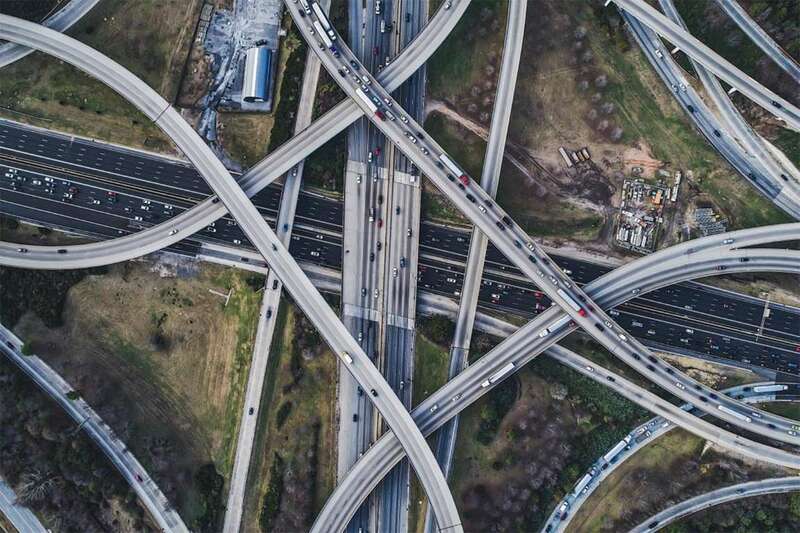 From paths leading to brick walls, to parking spaces that are nigh on impossible to access, there are all sorts of unfortunate construction mistakes that have been spotted - here are 12 of the worst of them. You could get a number one that, in the long run, sells considerably fewer copies than a number two, for example. Many artists have thrived without reaching the top of the UK Singles Chart and here are 11 of them. These parents experienced a jolt when they realized what their kids had done in their absence, have you gone through any of this ever? It's time to pick a side!